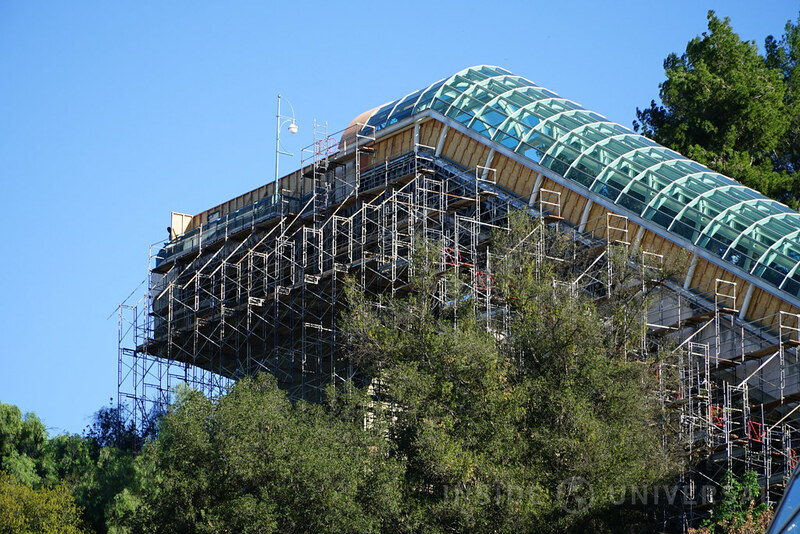 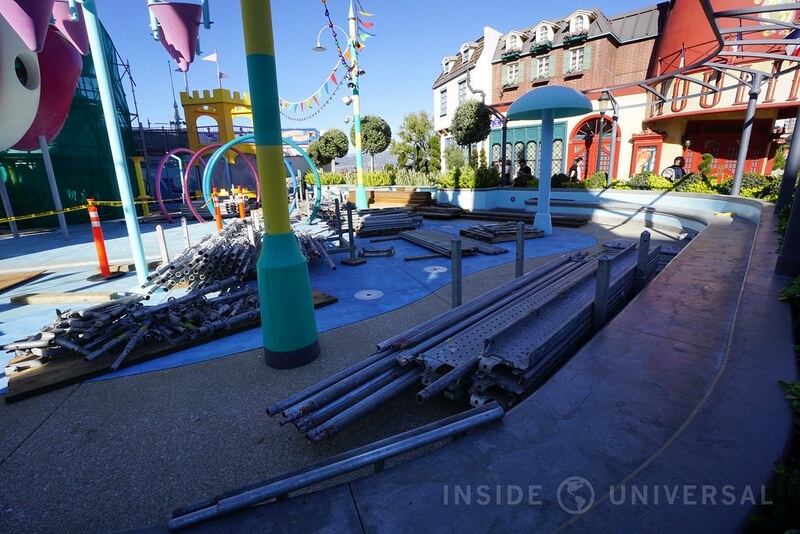 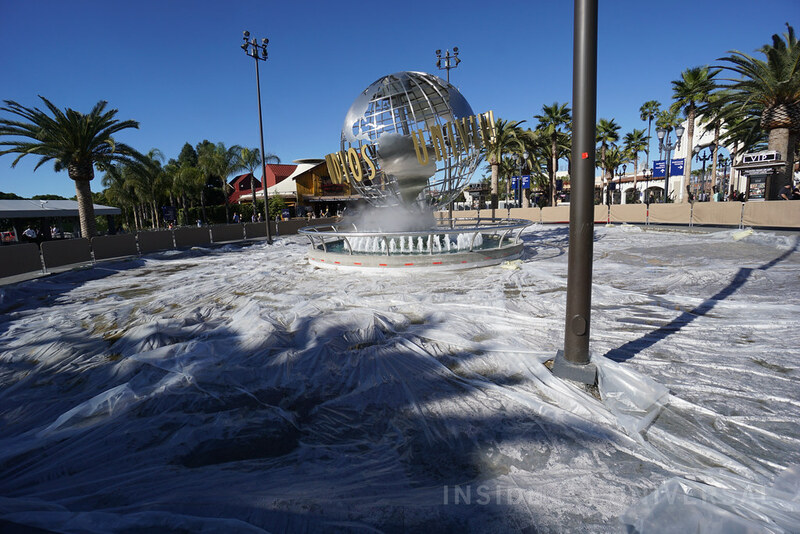 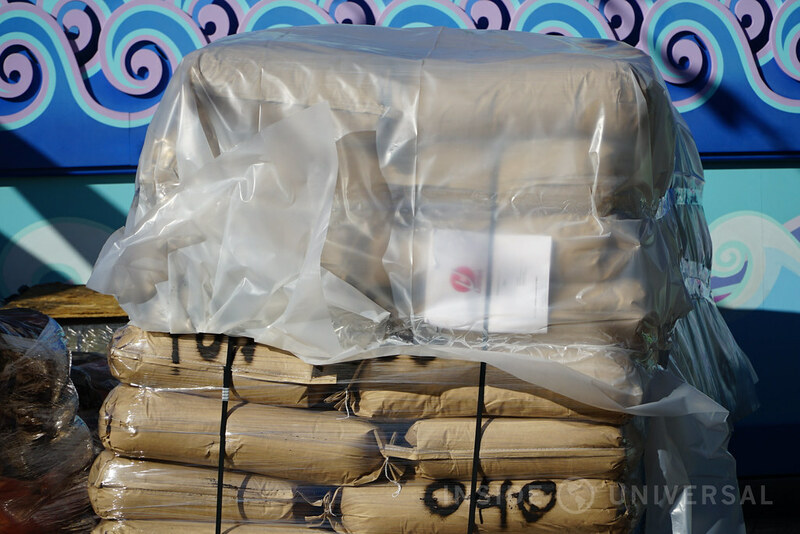 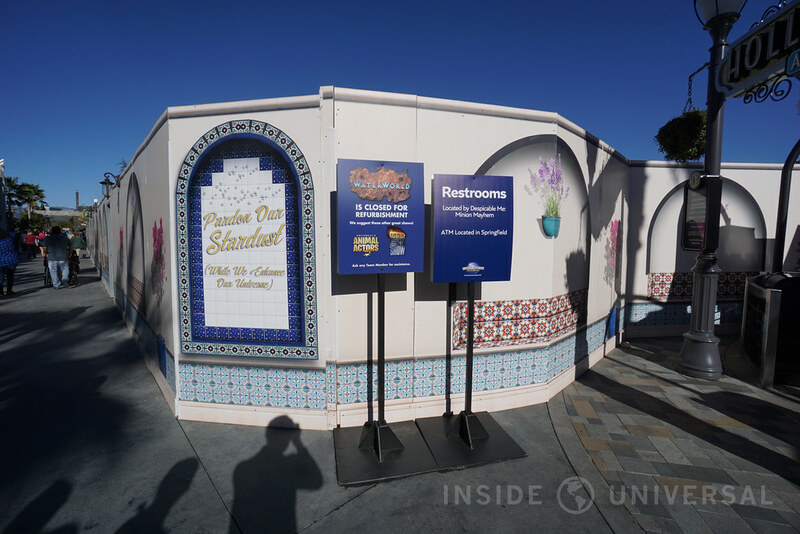 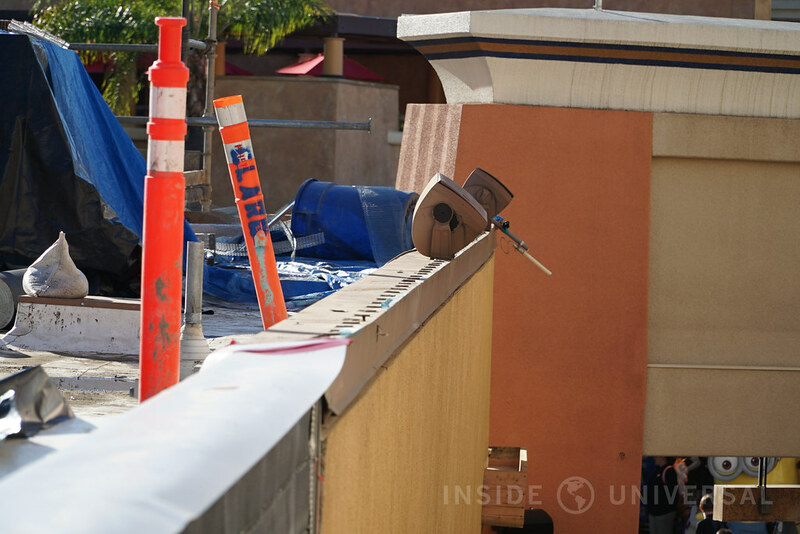 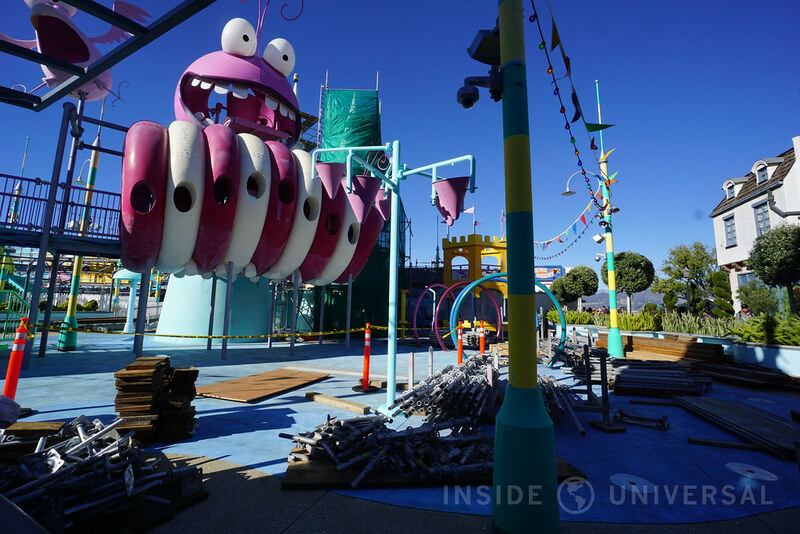 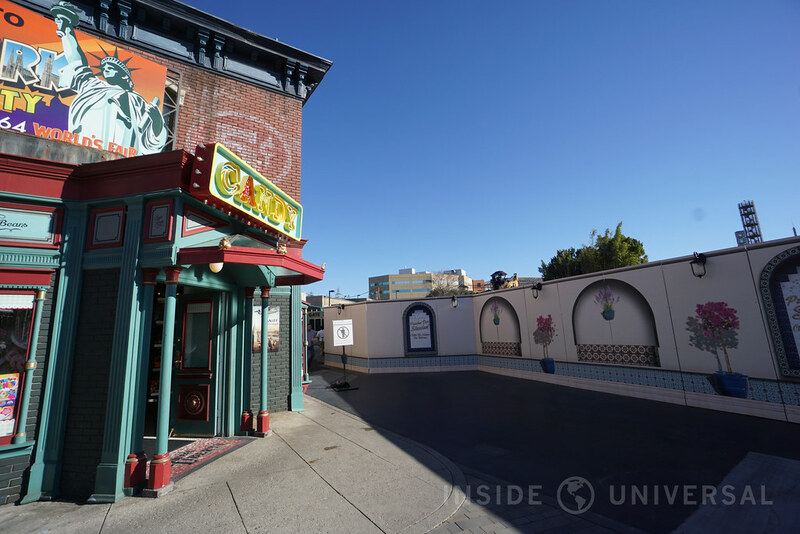 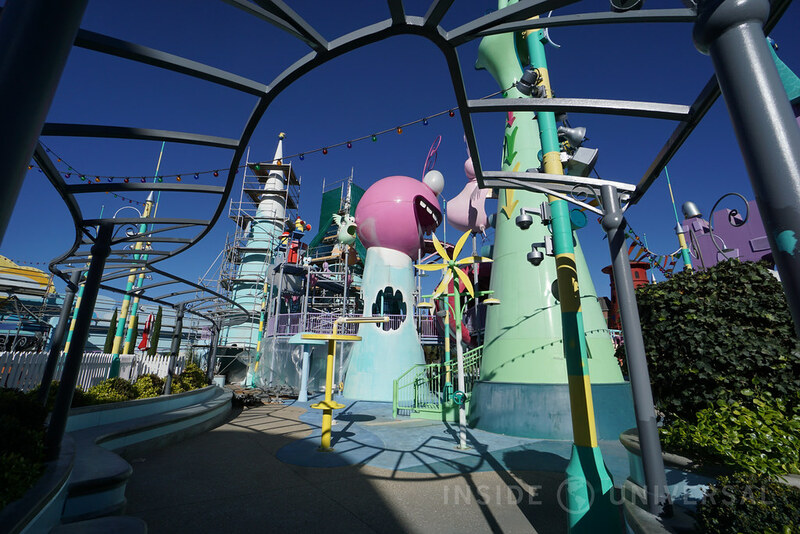 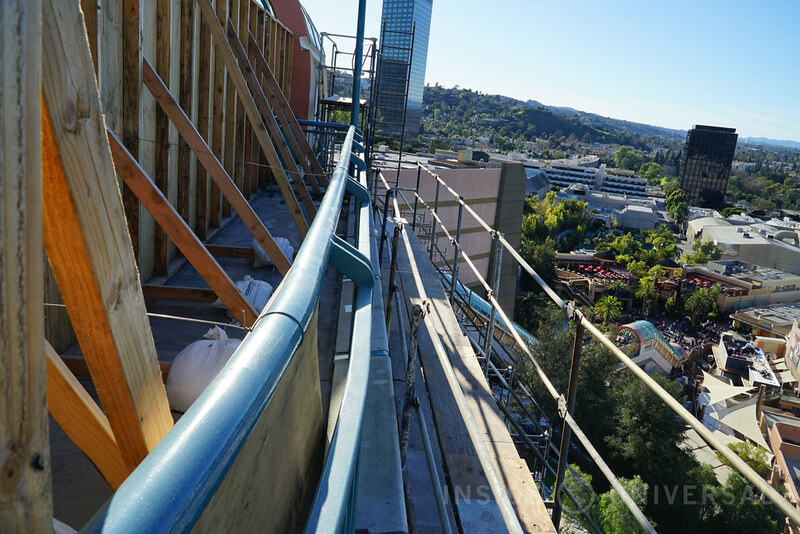 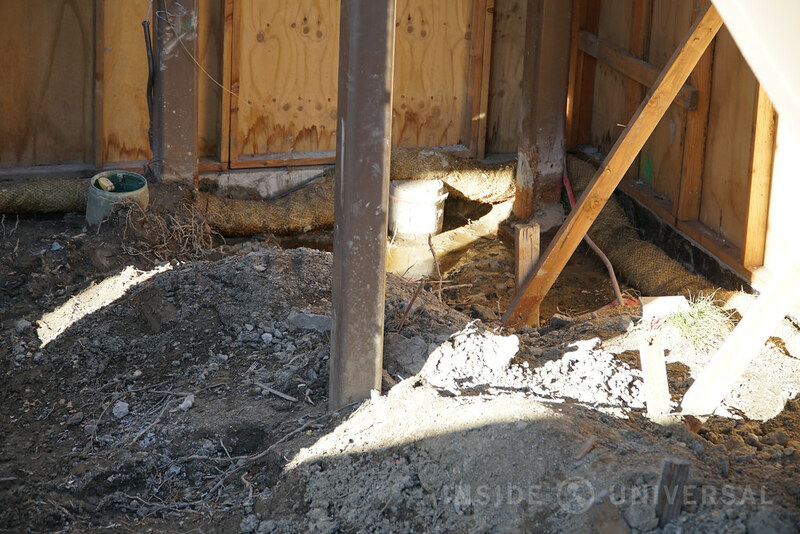 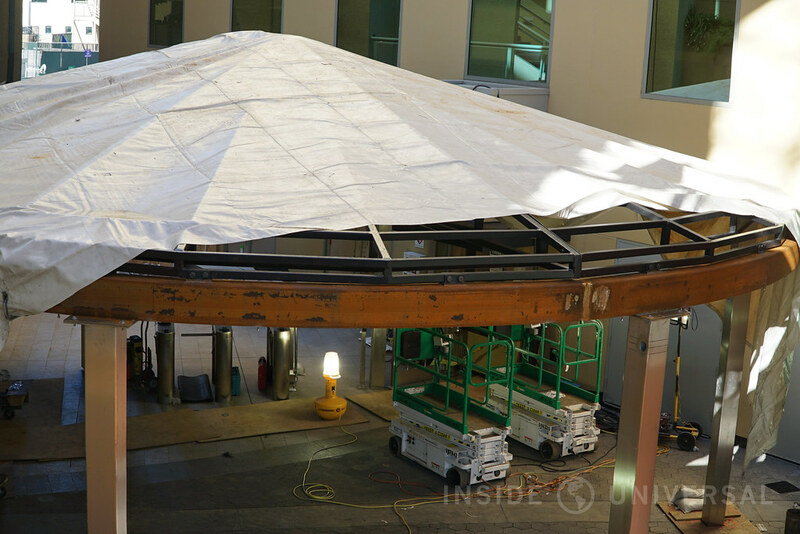 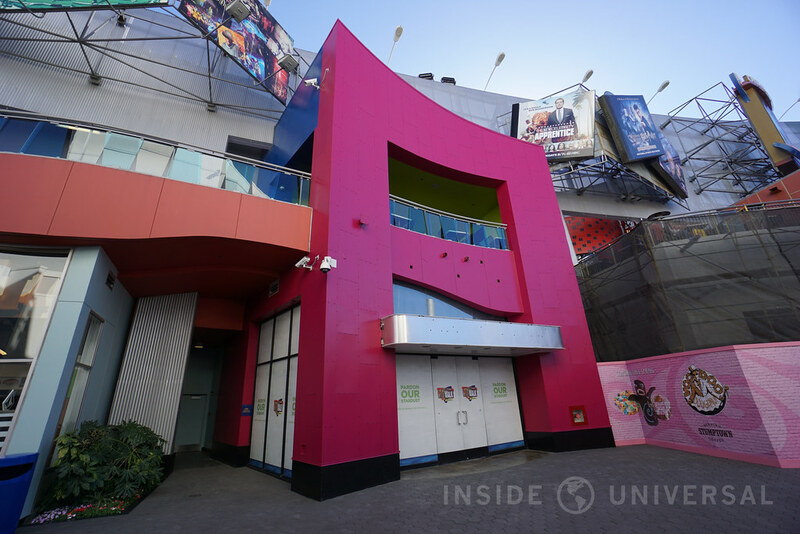 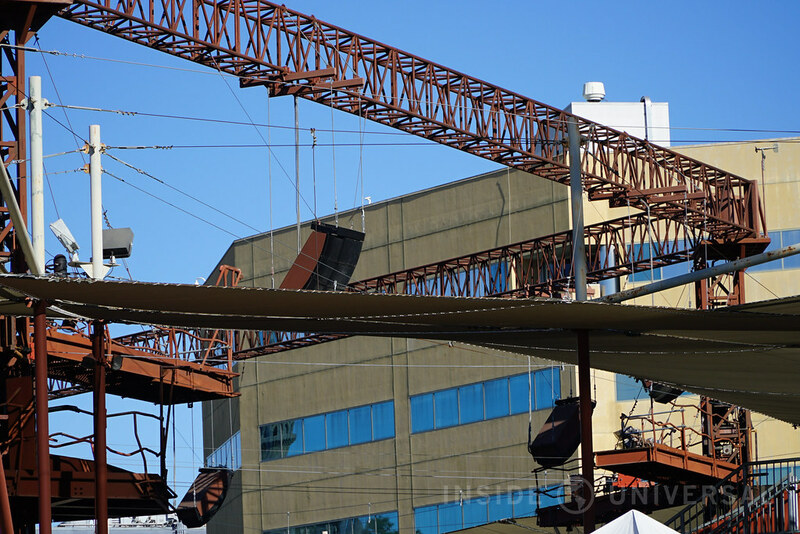 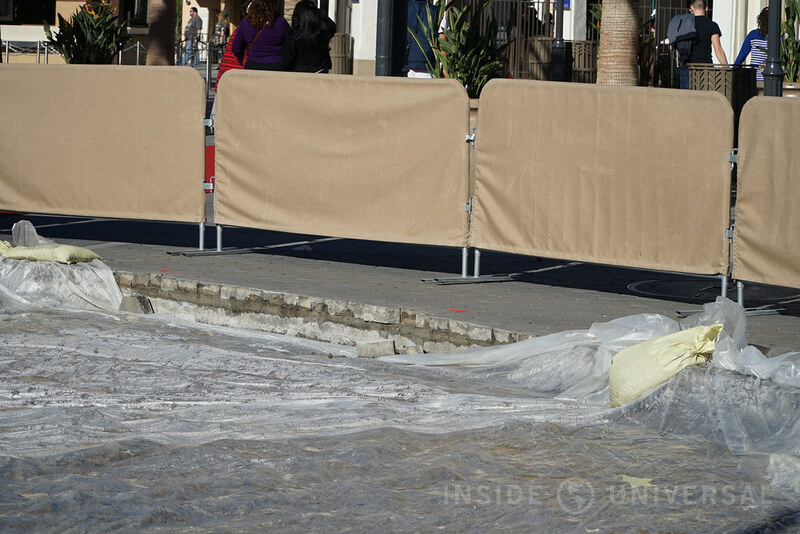 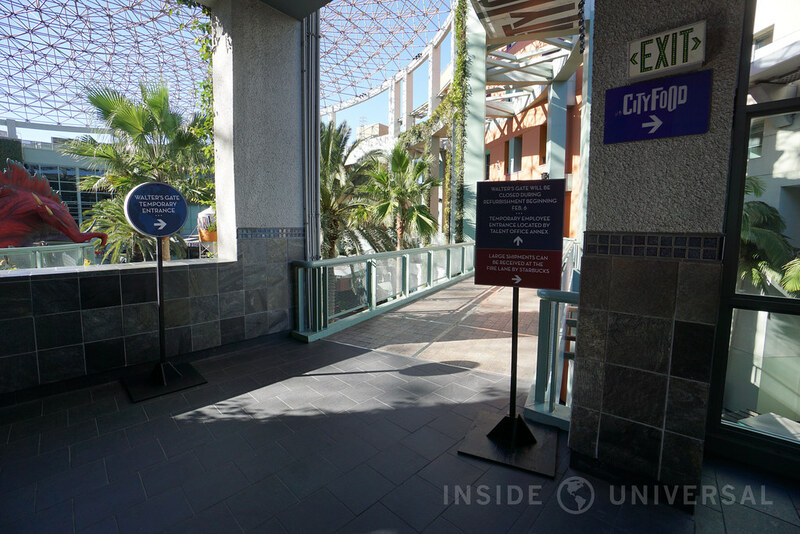 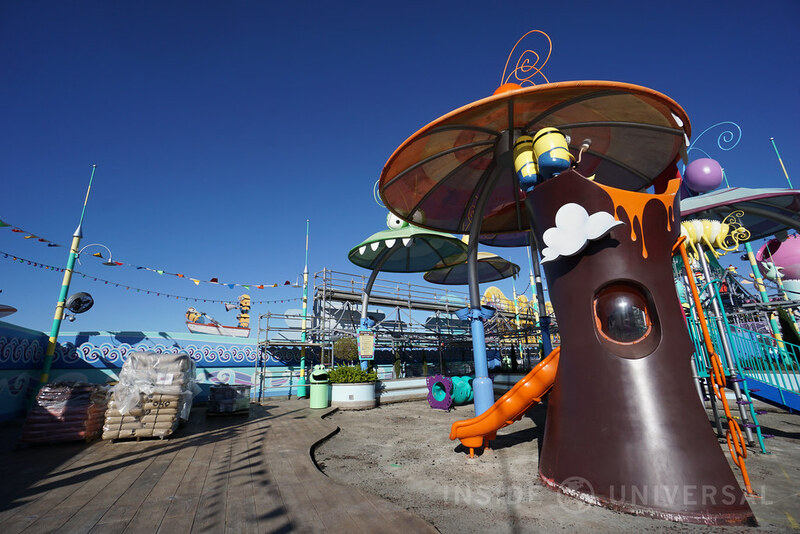 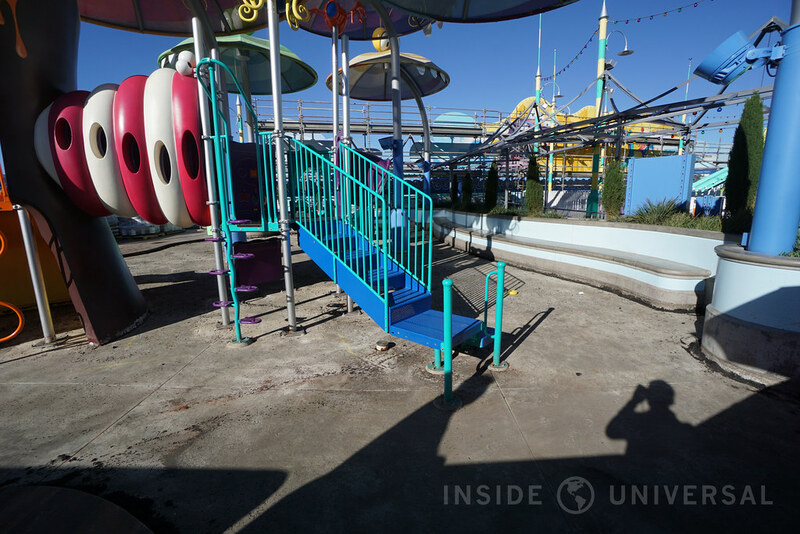 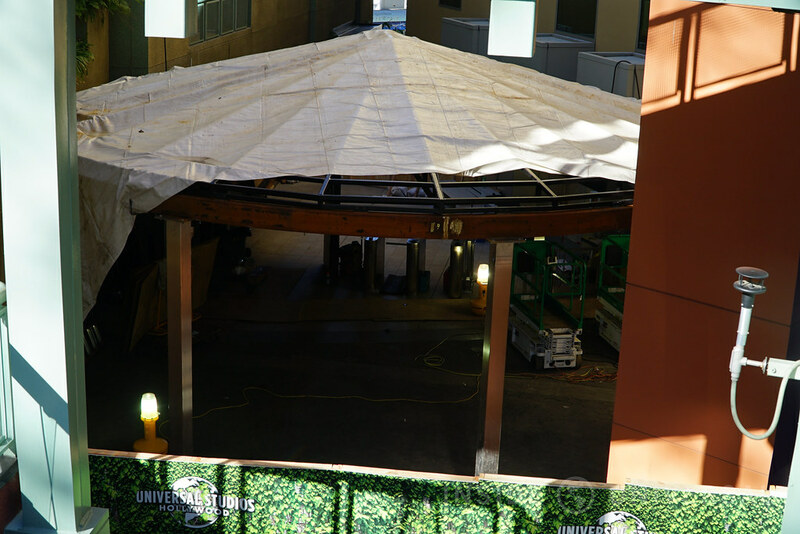 Hello everyone, we’re back with another photo update from Universal Studios Hollywood – this time focusing on CityWalk’s ongoing revitalization, some construction occurring at the front of the park, WaterWorld’s ongoing refurbishment, StarWay work and more! 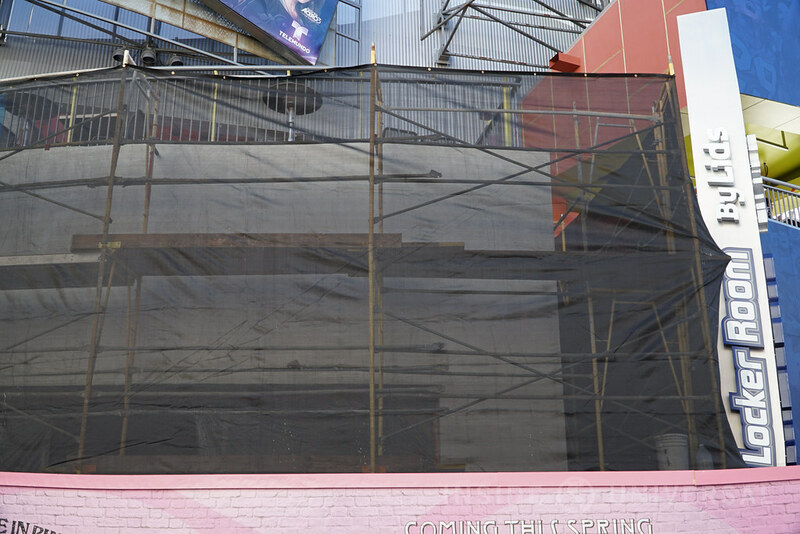 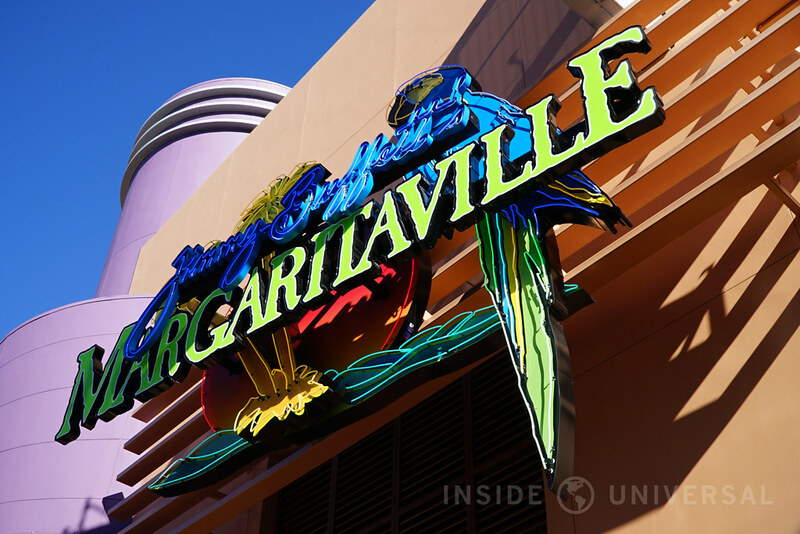 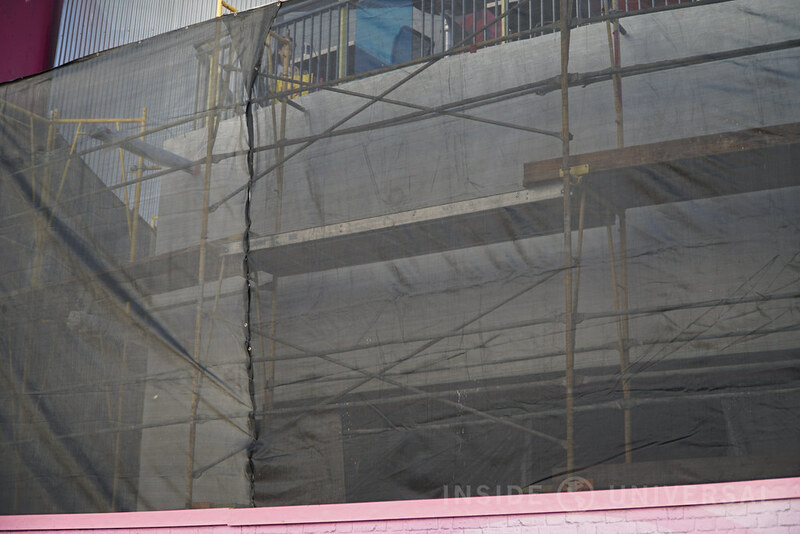 Now that Jimmy Buffett’s Margaritaville has opened to the public, construction crews have focused their attention on Voodoo Doughnut and Menchie’s Frozen Yogurt – the former of which now has scaffolding covering its exterior. 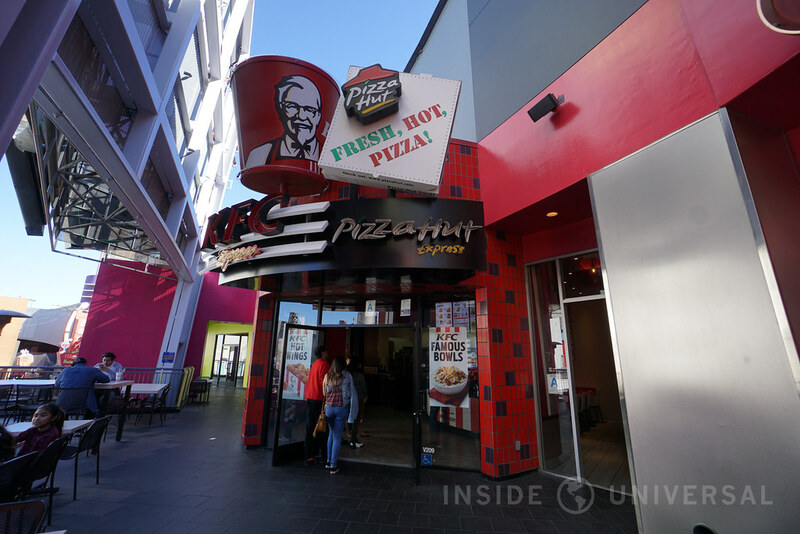 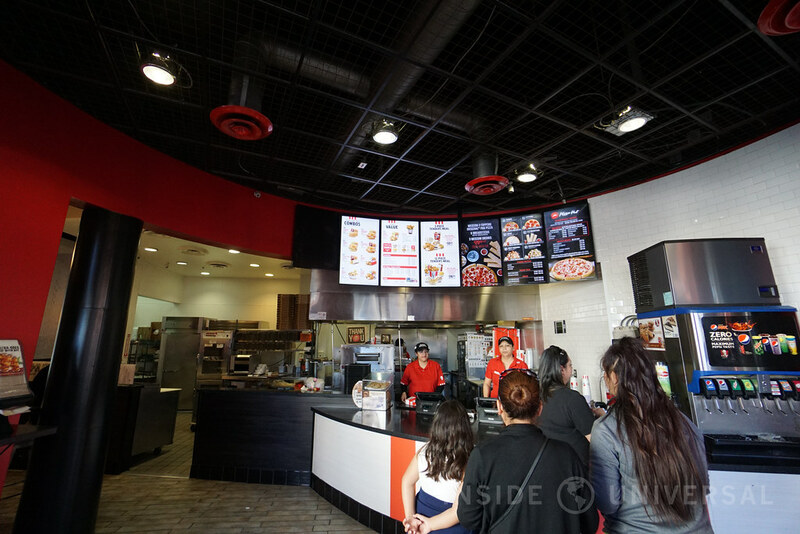 Meanwhile, KFC/Pizza Hut restaurant located at CityFood has reopened after a brief refurbishment. 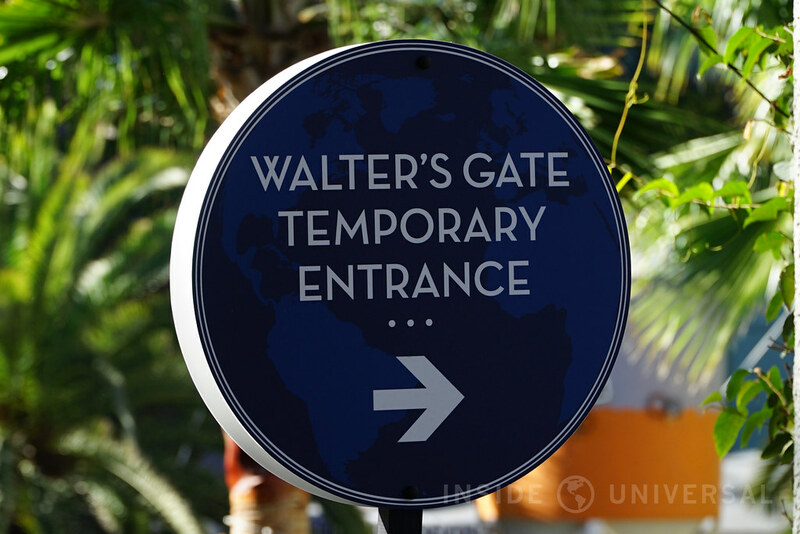 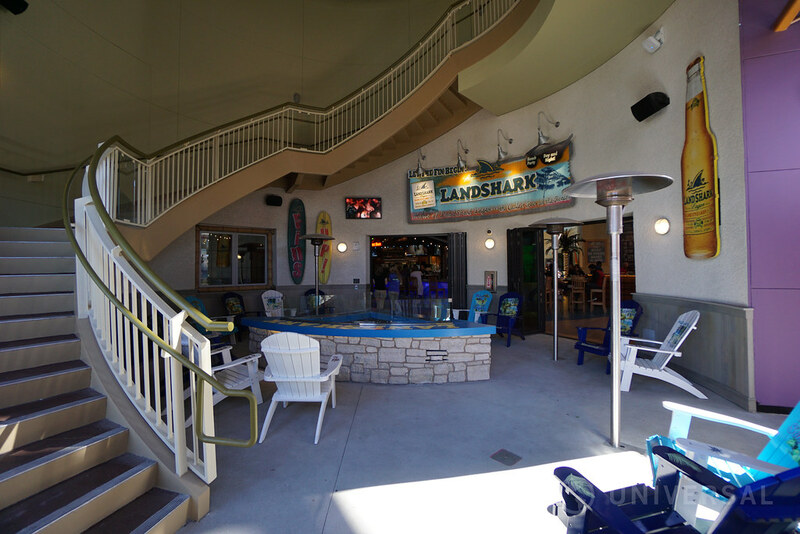 Employees that enter through Walter’s Gate will also experience some construction, as crews work to modify the CityWalk employee entrance to the park. 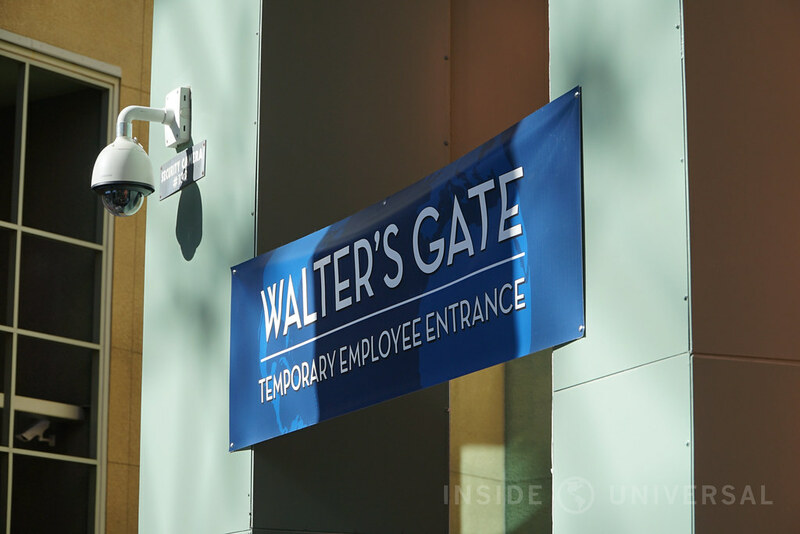 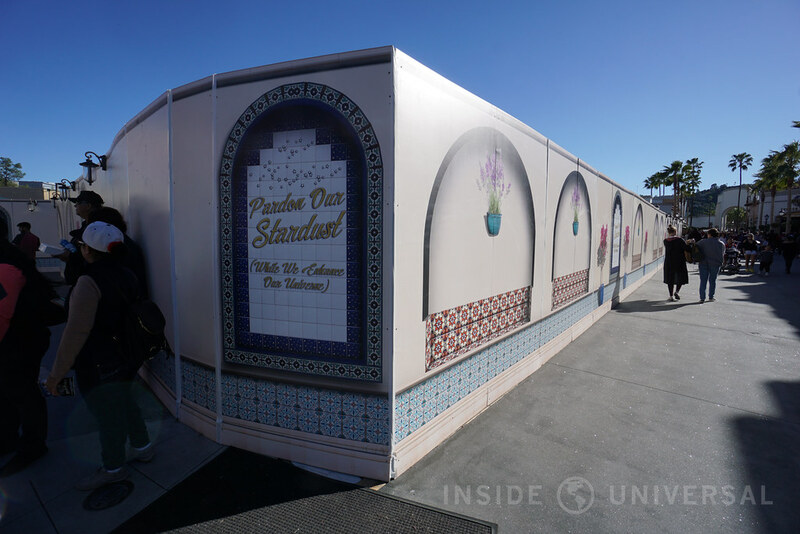 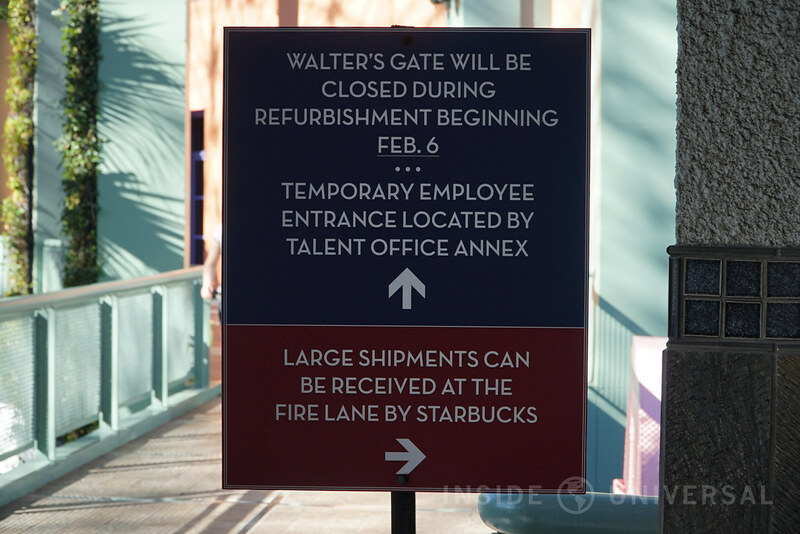 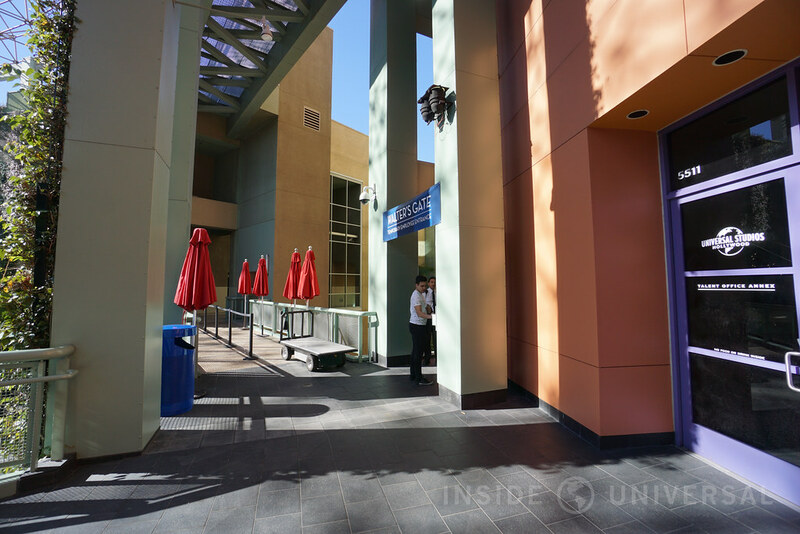 For now, employees can enter a pathway next to the talent office annex, where a temporary checkpoint has been setup. 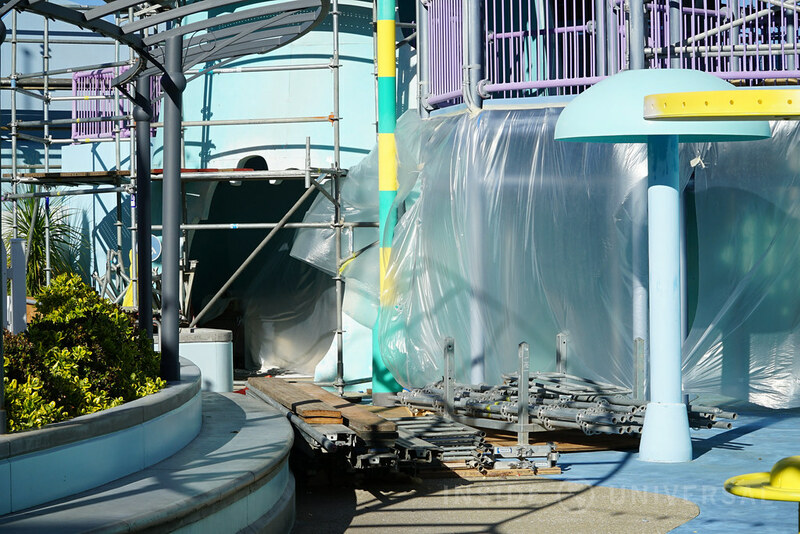 The park entrance is also undergoing some work, with construction crews repaving the flooring surrounding the Universal globe. 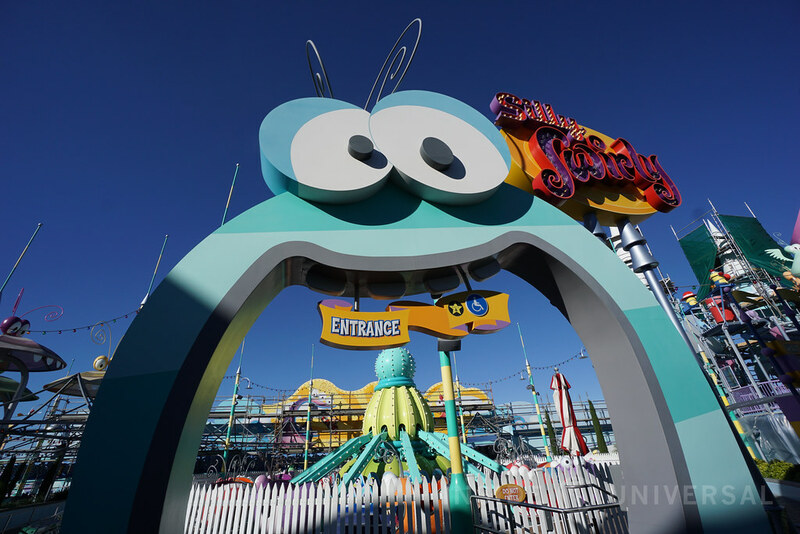 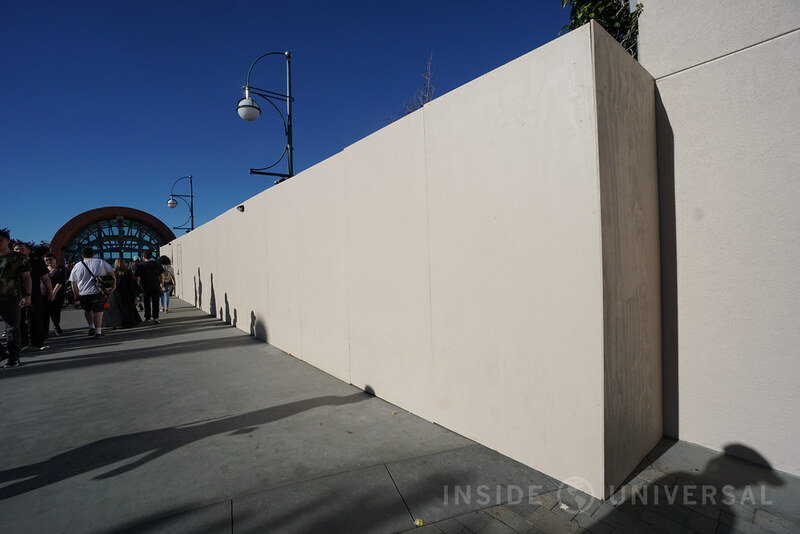 Low-profile construction barriers still allow guests to take their photo next to the Universal landmark, but the outer perimeter prevents guests from approaching the globe up-close. 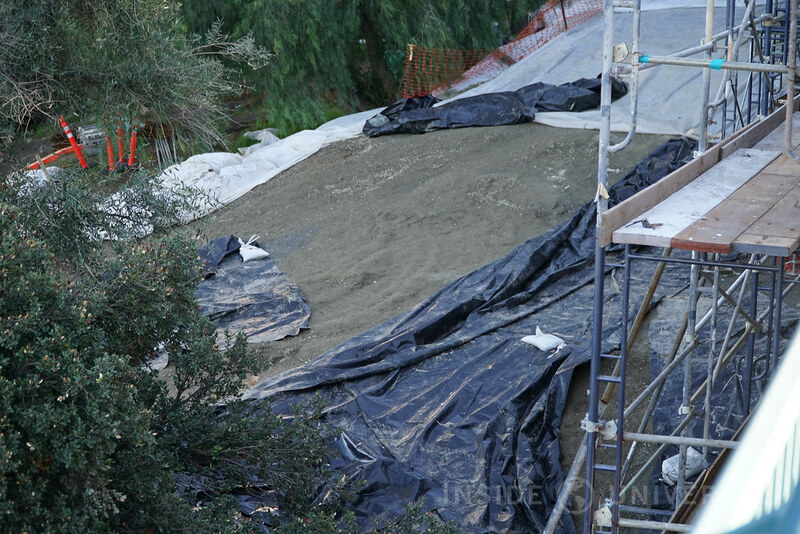 As to the extent of the work, we’re not exactly sure. 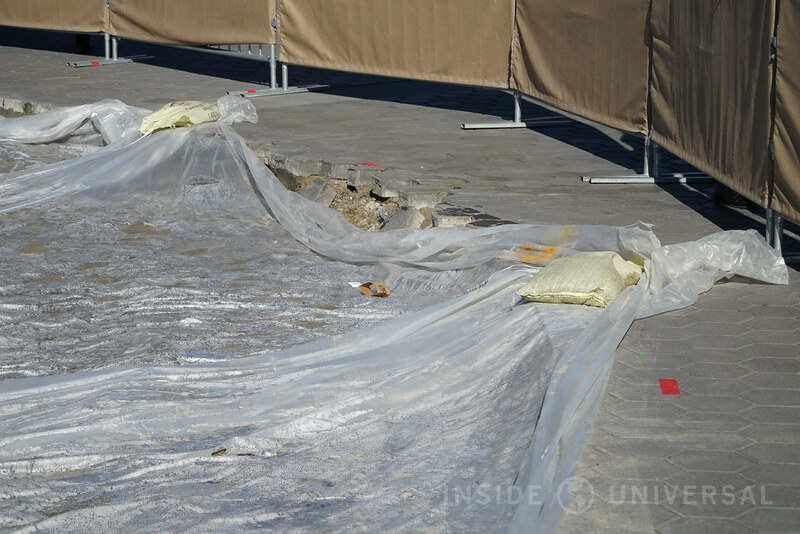 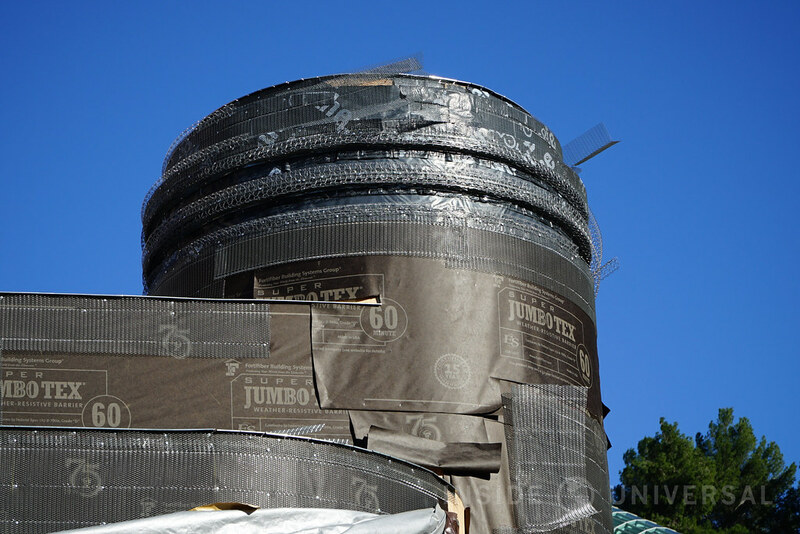 Could Universal be getting a new globe in the near future, or is this simple pavement work? 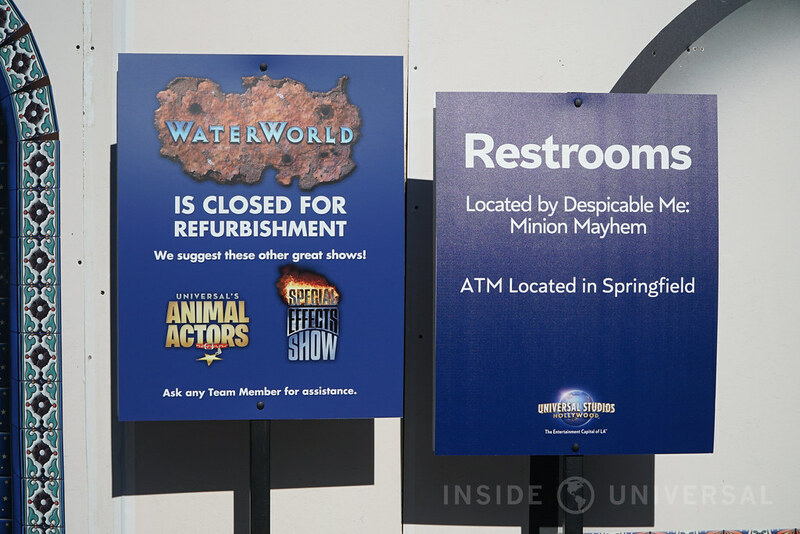 Meanwhile, WaterWorld – and by extension, WaterWorld way – continue to undergo significant refurbishment, with crews visibly working on the show’s set and the pathway leading to the arena. 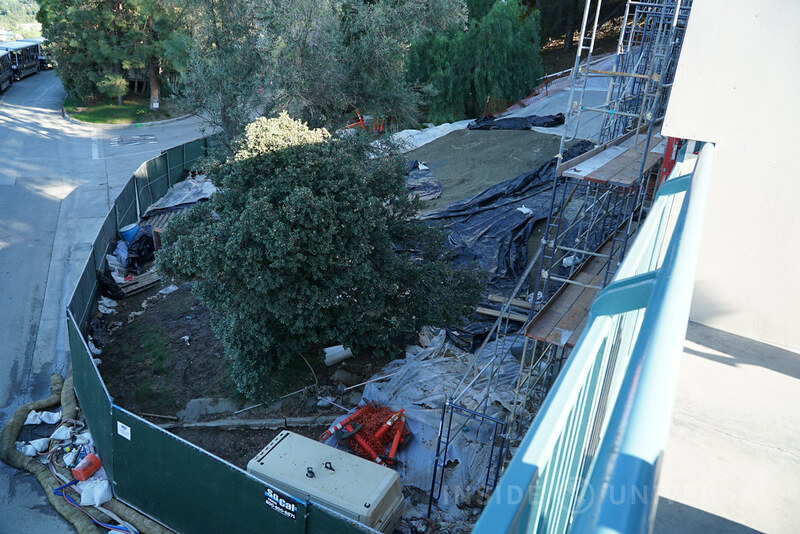 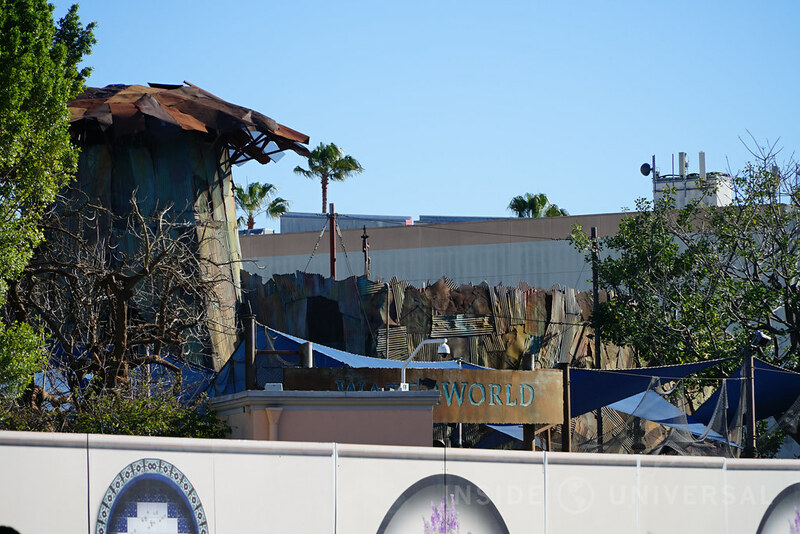 For now, construction walls continue to surround the pathway to WaterWorld alongside the former plot of the Cartooniversal gift shop. 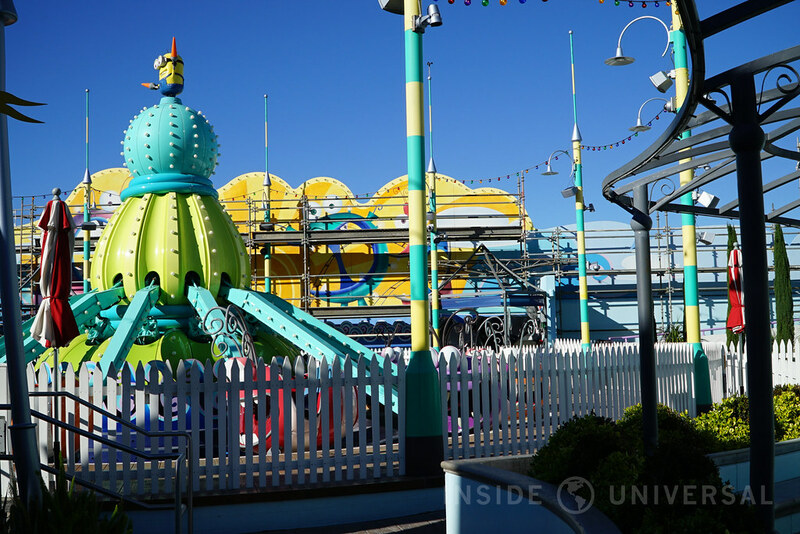 Moving towards another area in the park, Super Silly Fun Land is also undergoing a significant refurbishment during the park’s off season. 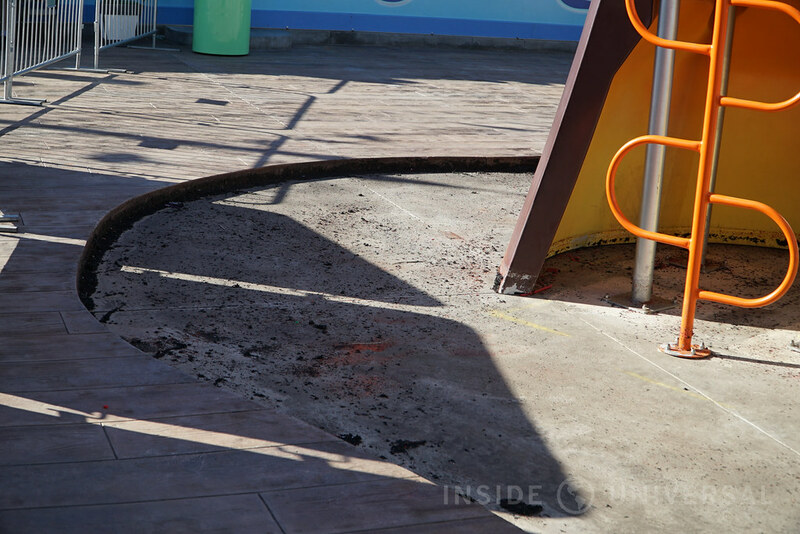 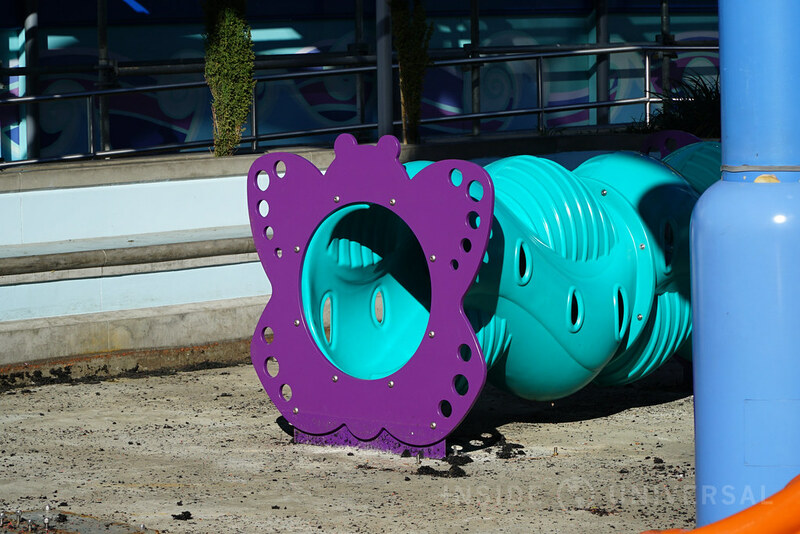 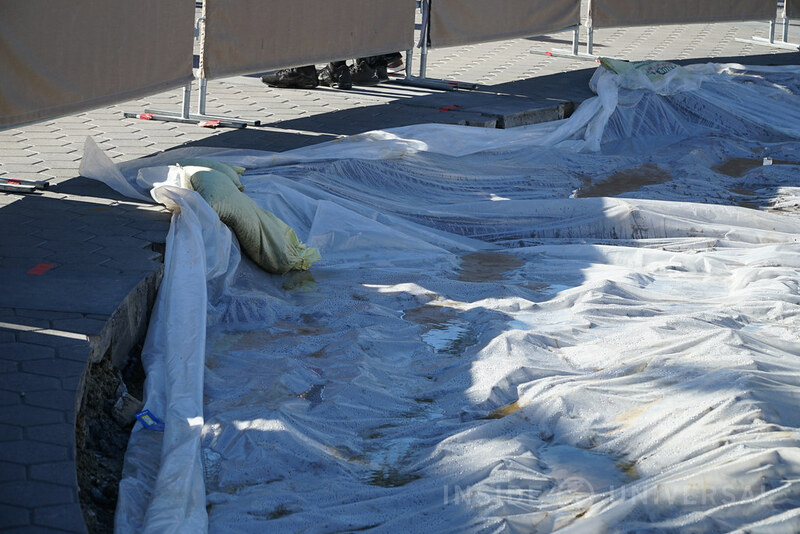 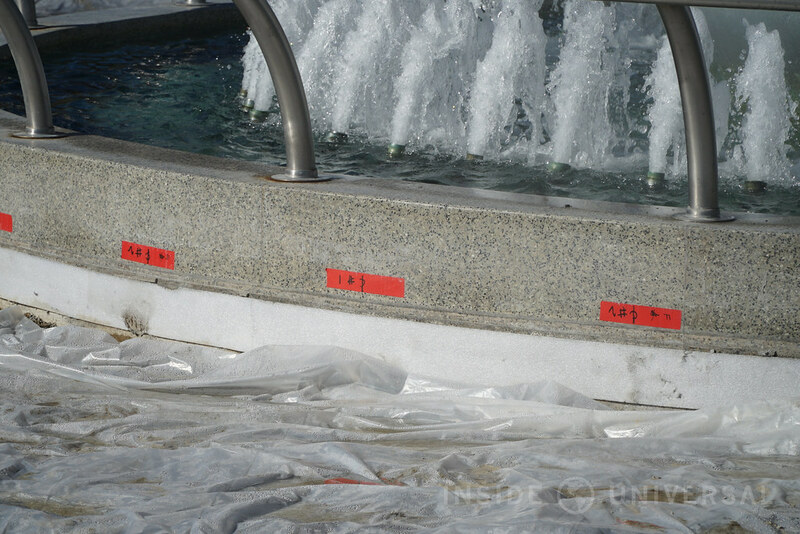 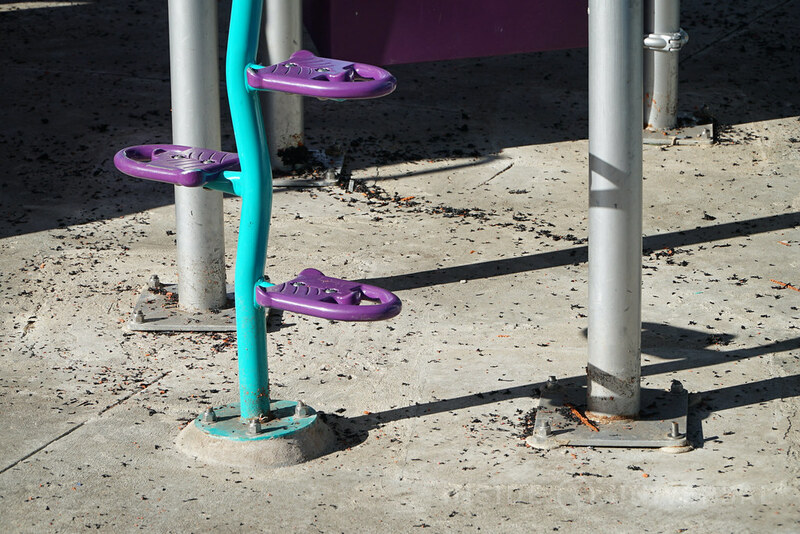 While the water playground undergoes routine maintenance, construction crews are also replacing the play area’s rubber flooring. 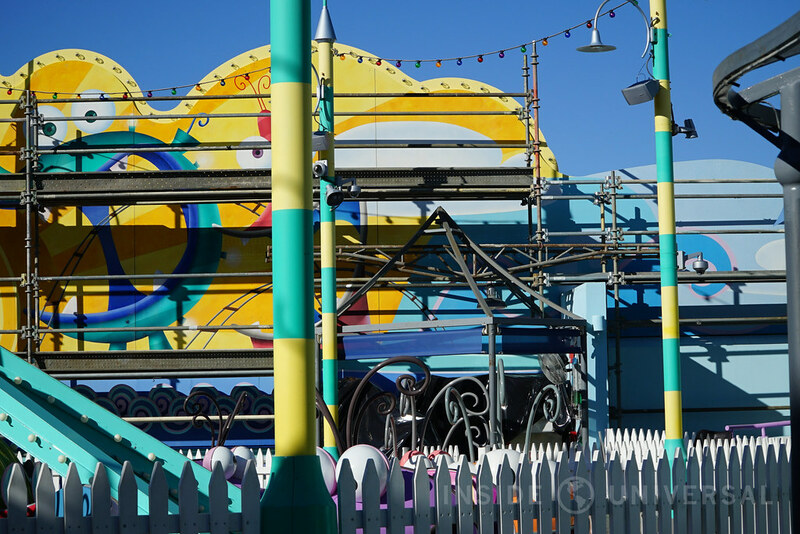 Finally, Silly Swirly is also closed as crews refurbish the surrounding mural. 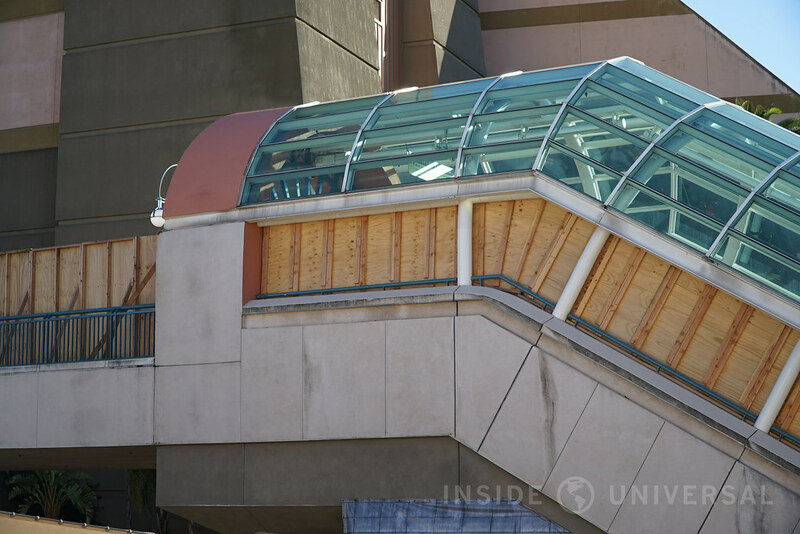 As we reported, the Universal StarWay is also undergoing a significant expansion that will add a fourth row of escalators to all four escalator banks. 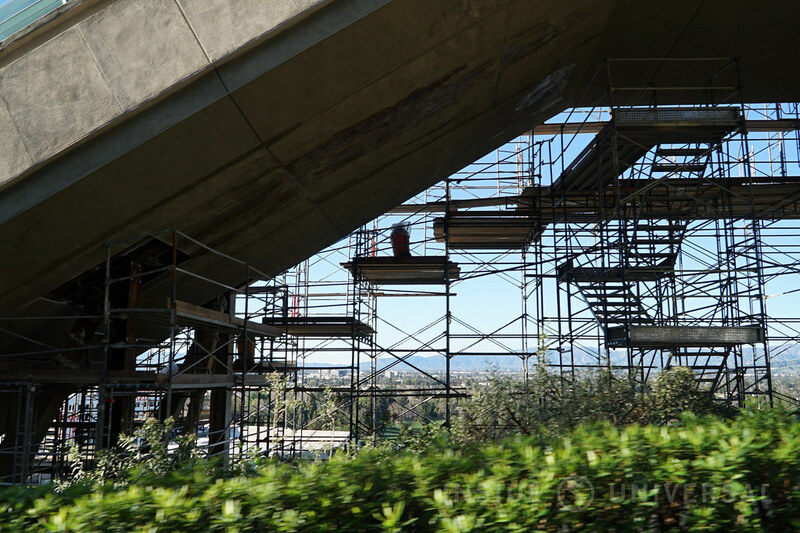 Extensive scaffolding has appeared around the StarWay pathway, with crews examining the structural supports underneath the escalator banks. 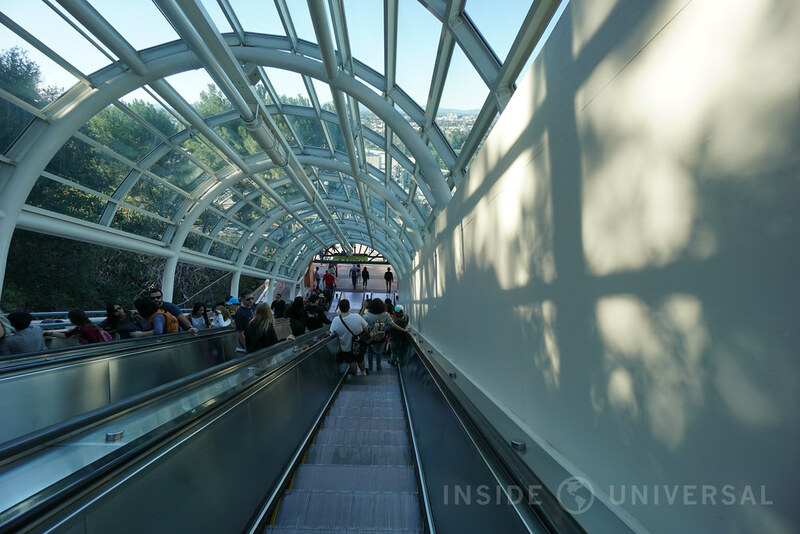 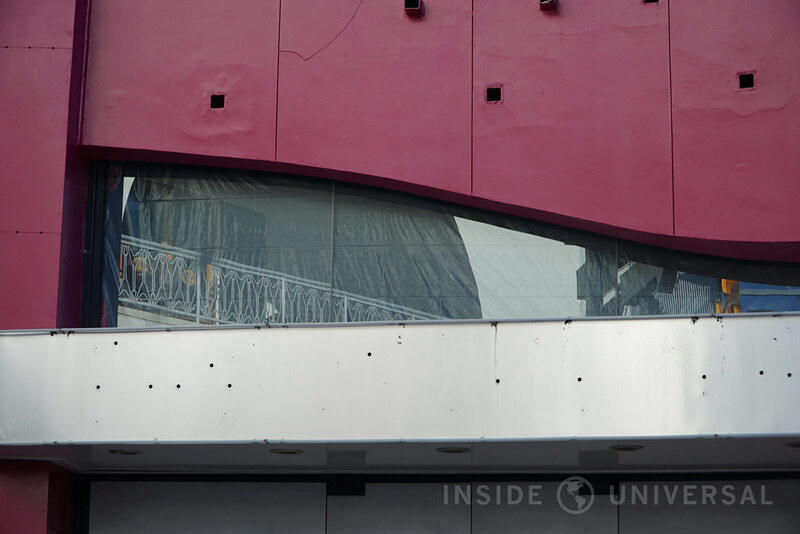 You can even see exposed mechanics of the escalator at work if you’re experiencing the Studio Tour – look closely as you pass by! 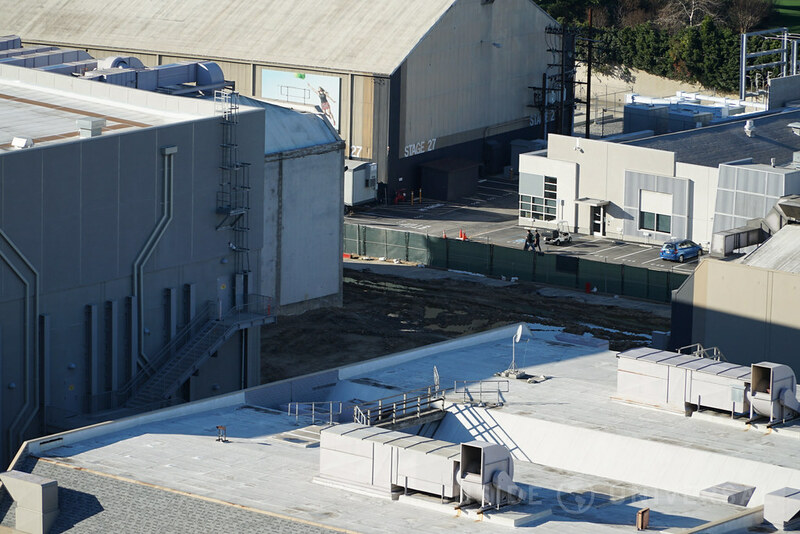 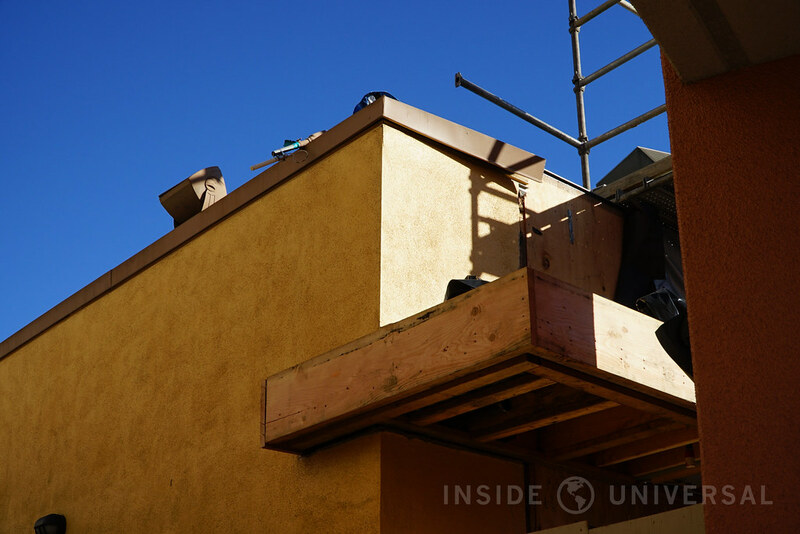 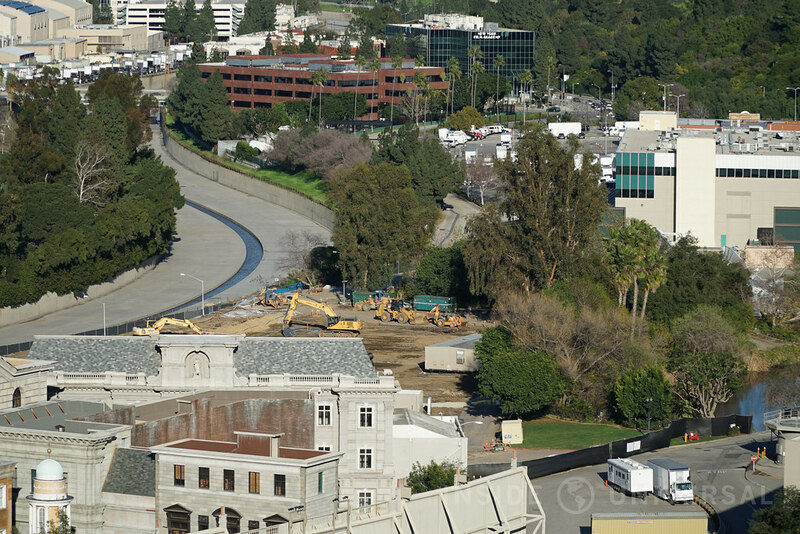 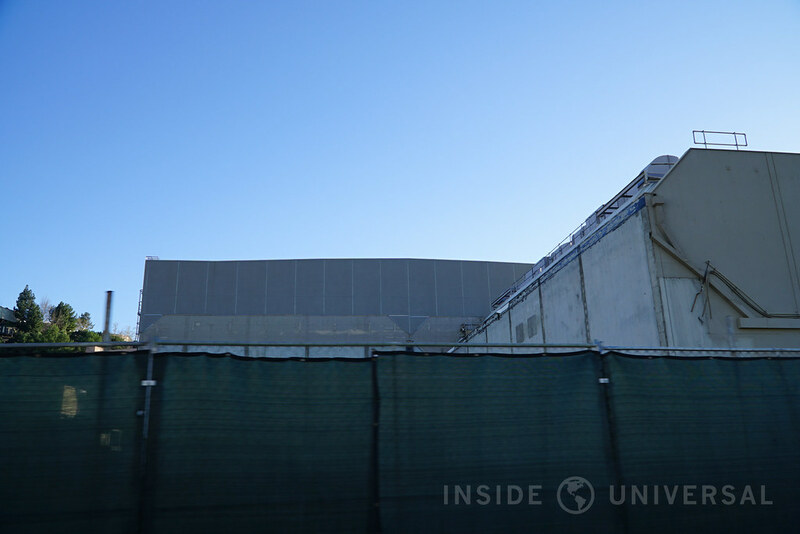 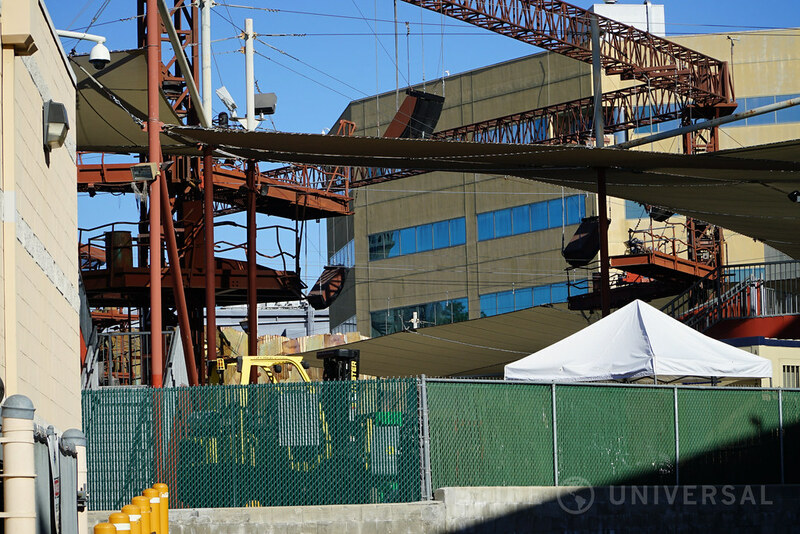 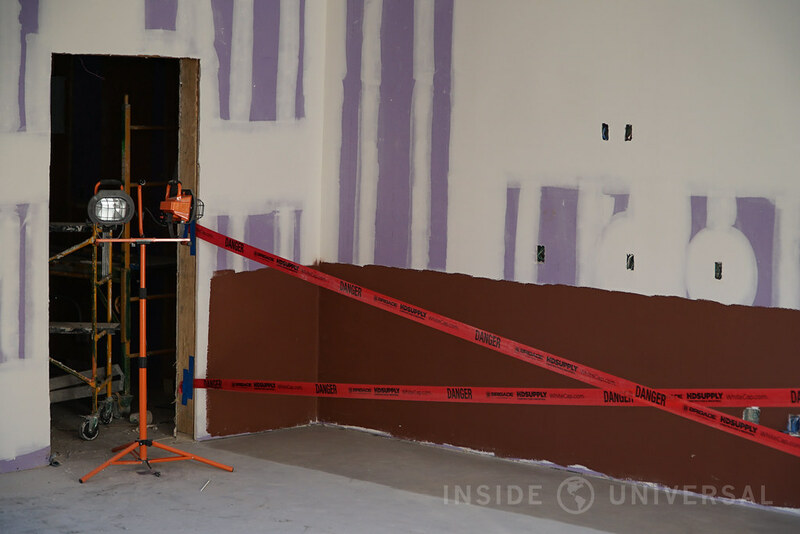 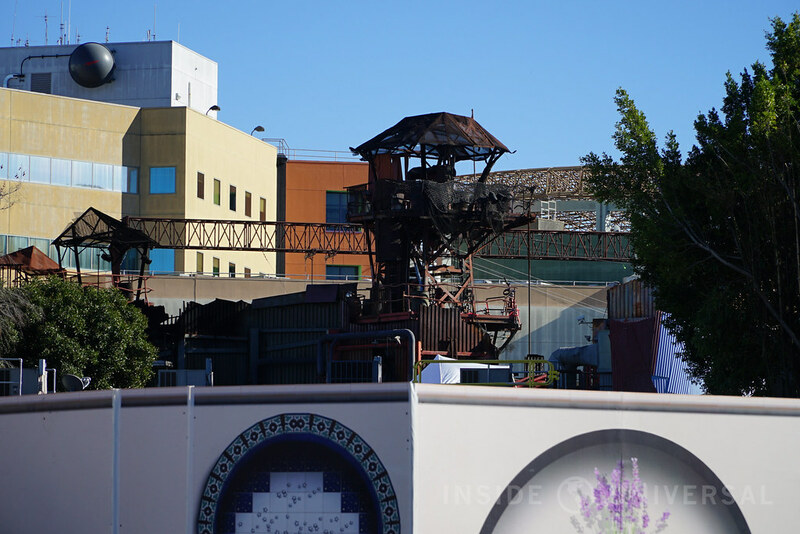 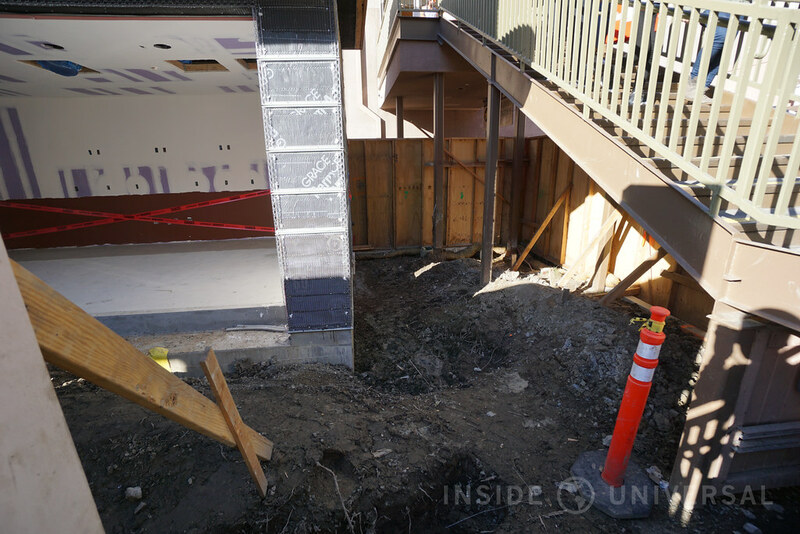 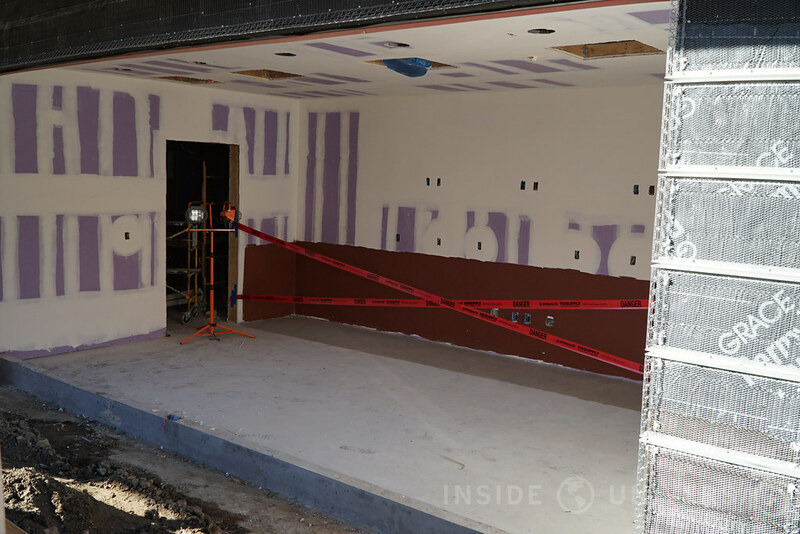 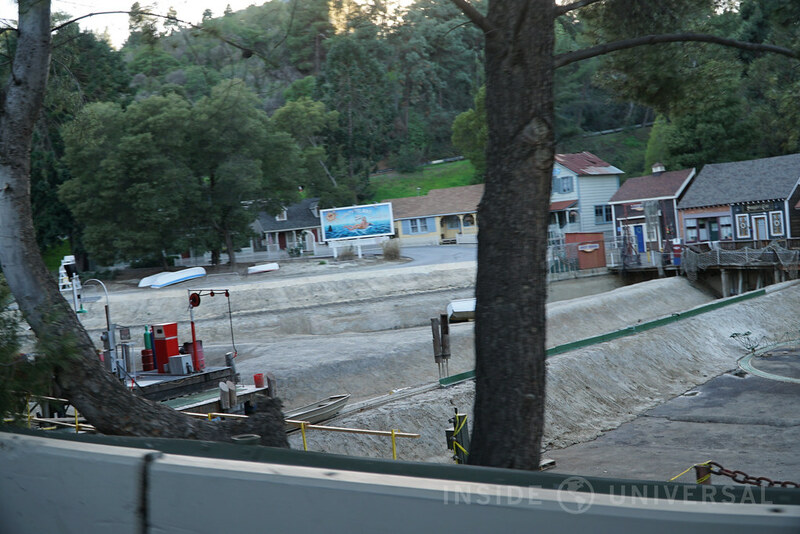 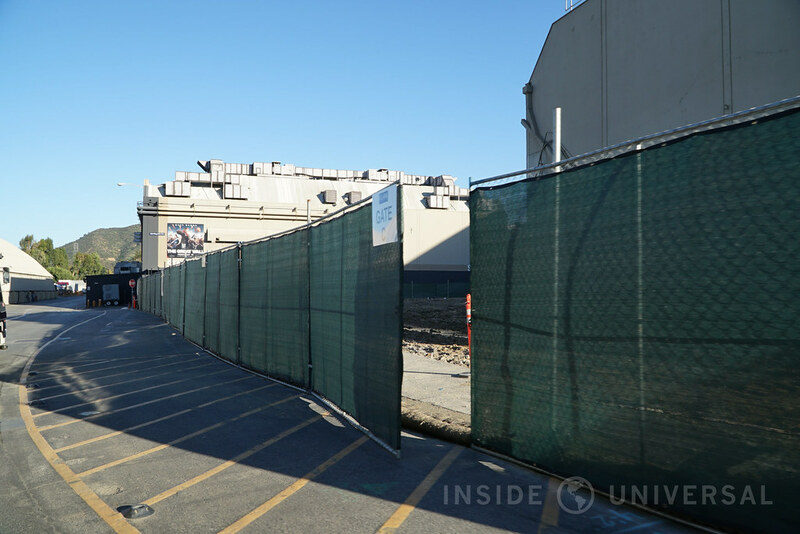 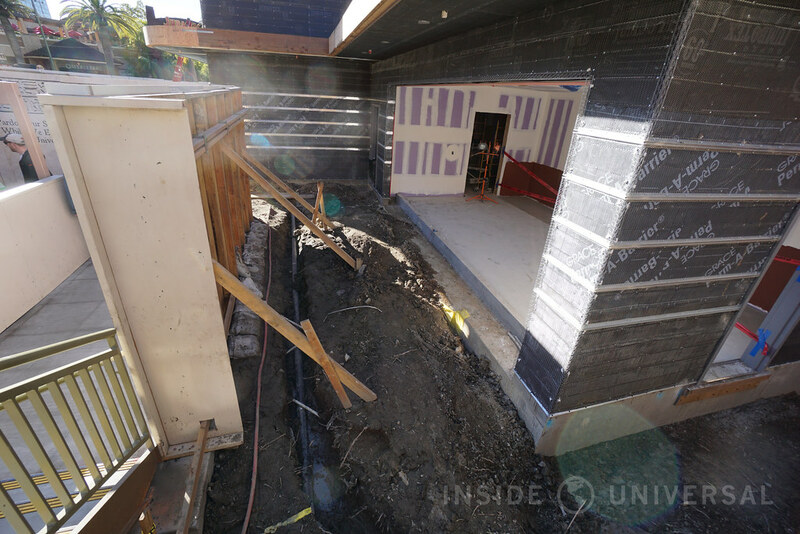 Proceeding to the Universal backlot, several construction projects are currently occurring on the lot as Universal works to modernize elements of the studio. 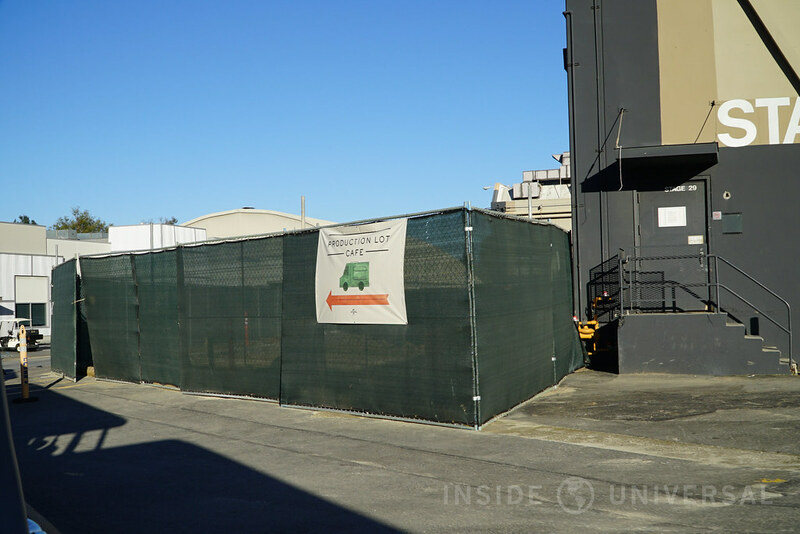 Soundstage 31, which was completely demolished earlier this year, remains walled off as crews work on the stage’s plot. 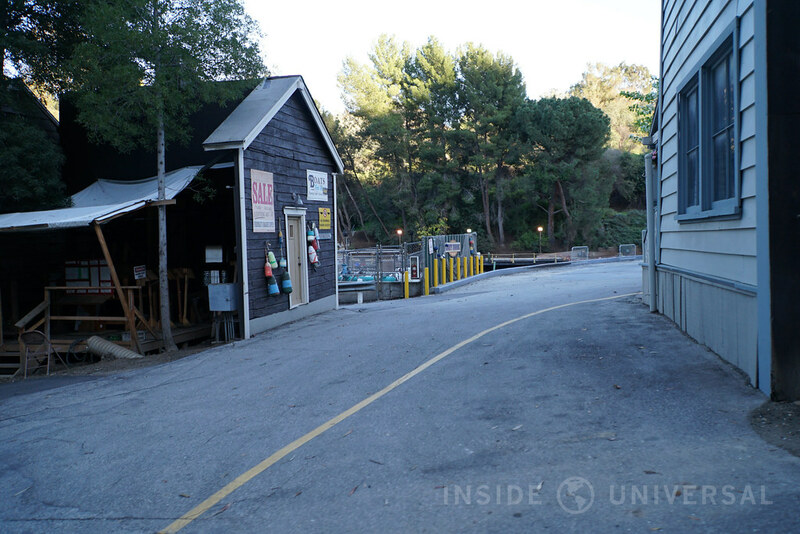 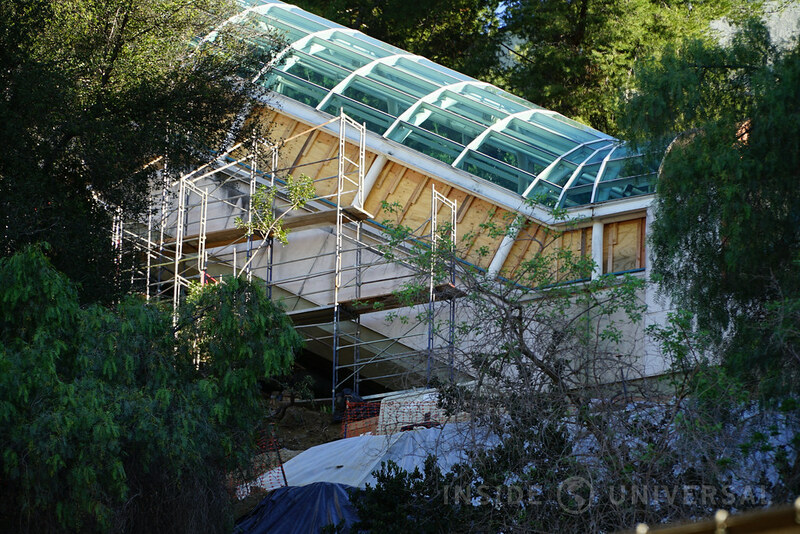 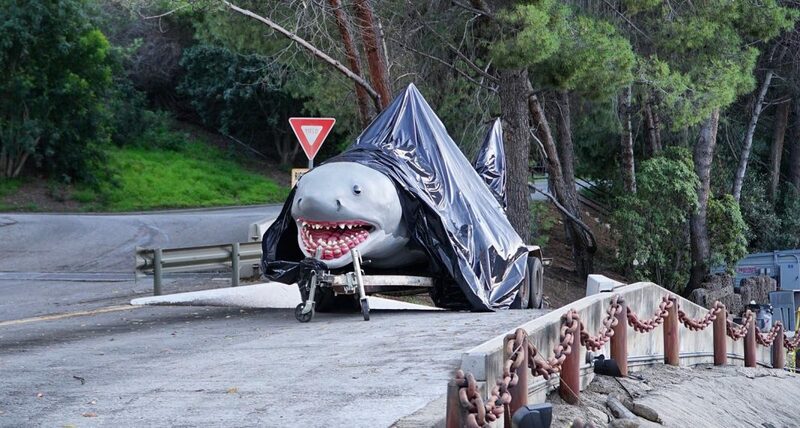 In addition, Jaws on the Studio Tour is also undergoing refurbishment. 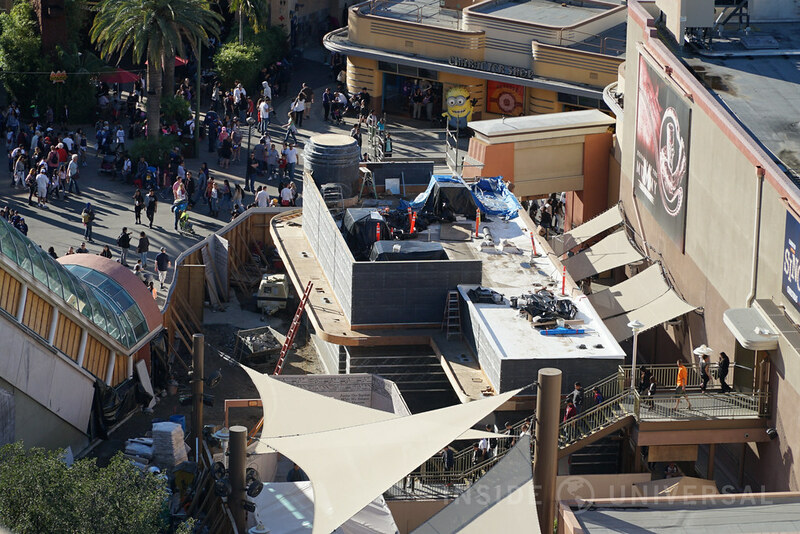 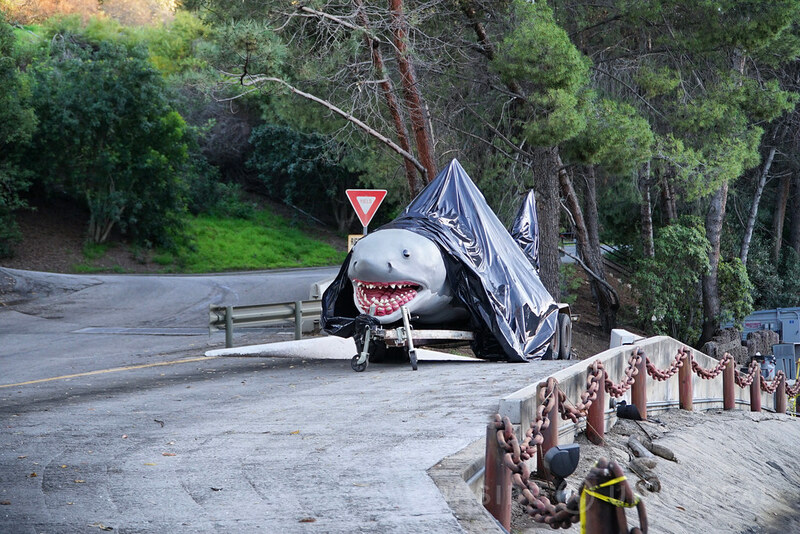 Jaws Lake is currently drained, and construction crews appear to be touching up set pieces in and around the animation. 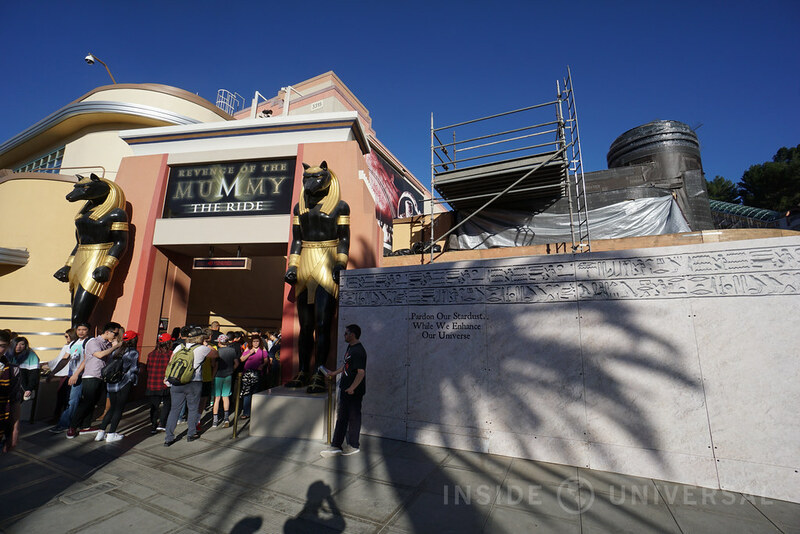 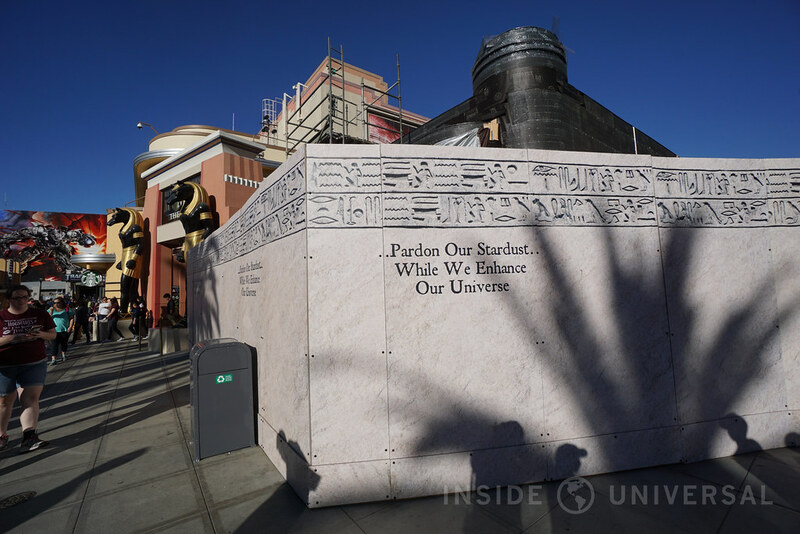 Finally, the Revenge of the Mummy locker rooms and Mummy Treats structure continue to undergo significant modifications. 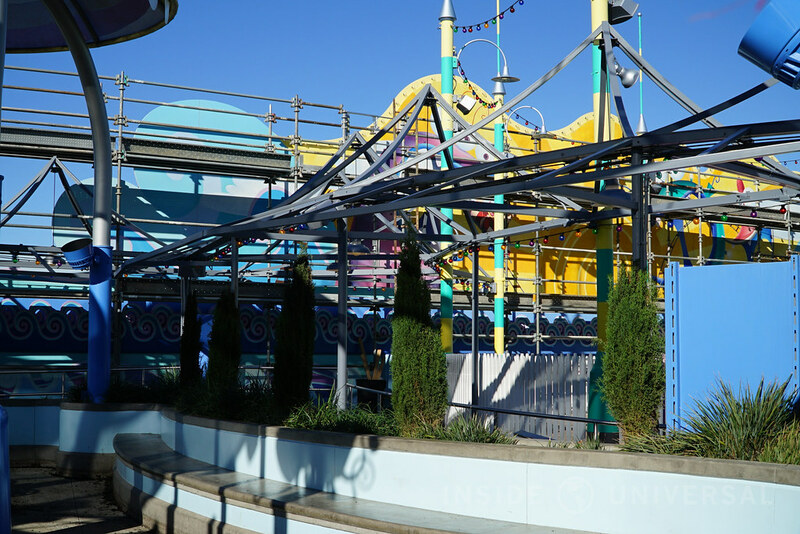 With the StarWay expanding, construction crews appear to be modifying the structure to accommodate the expanded StarWay row as it touches down at the Lower Lot. 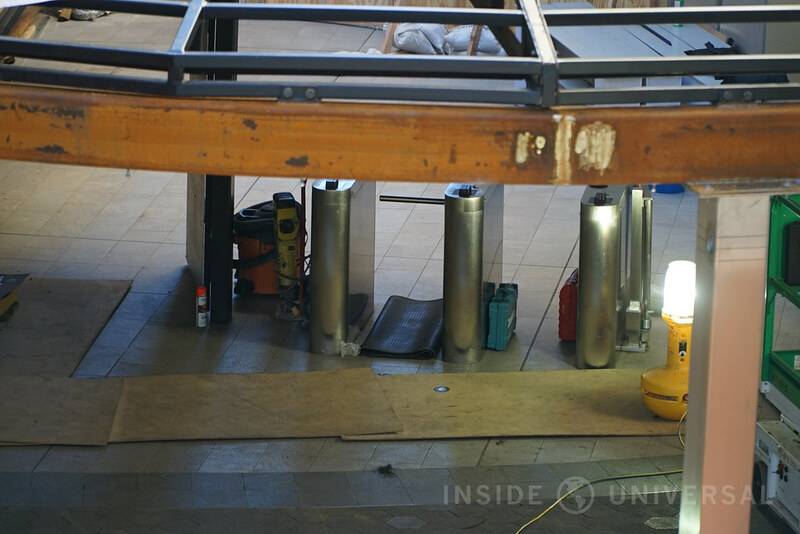 That concludes this update! 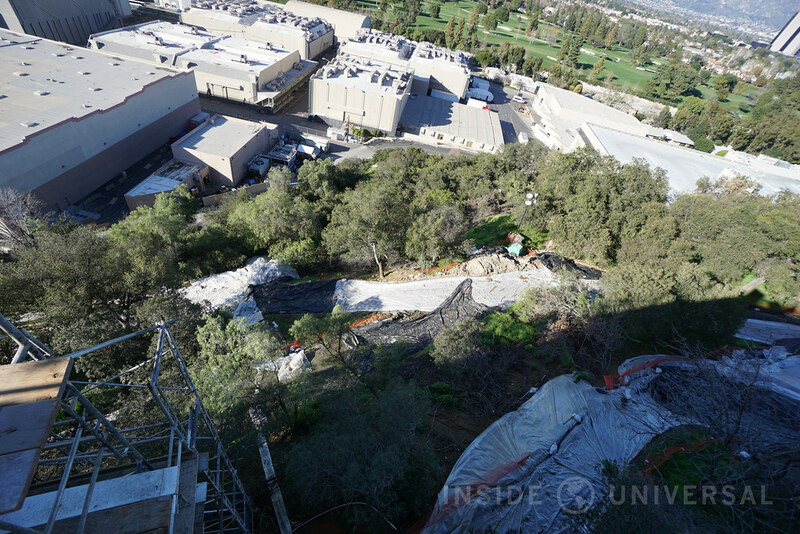 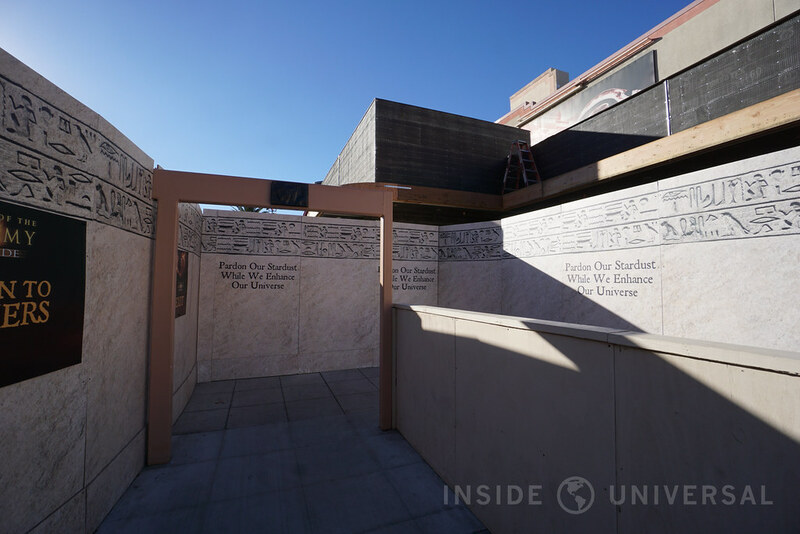 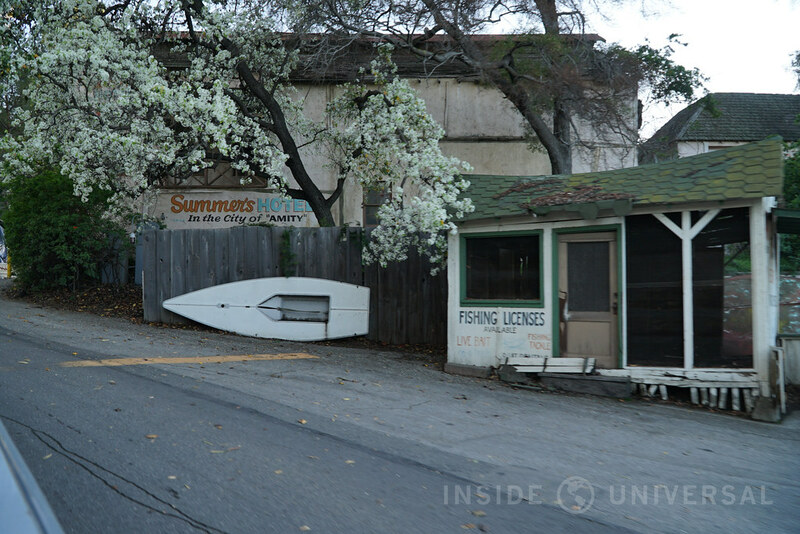 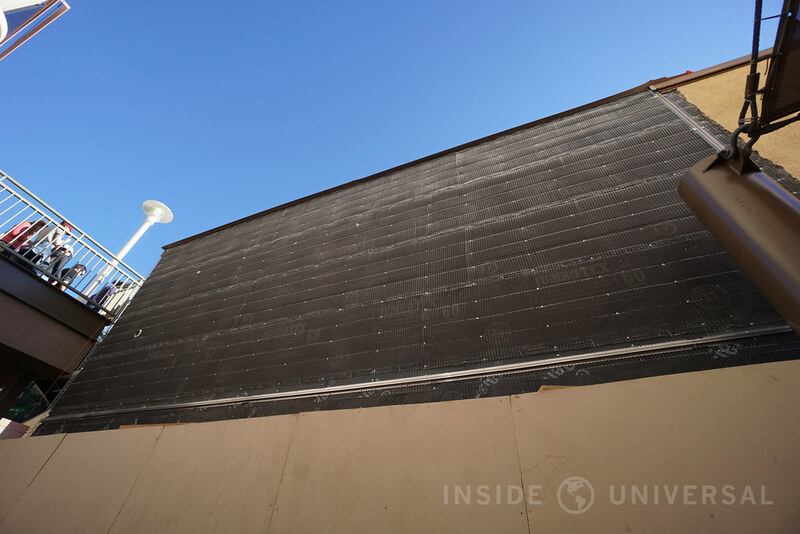 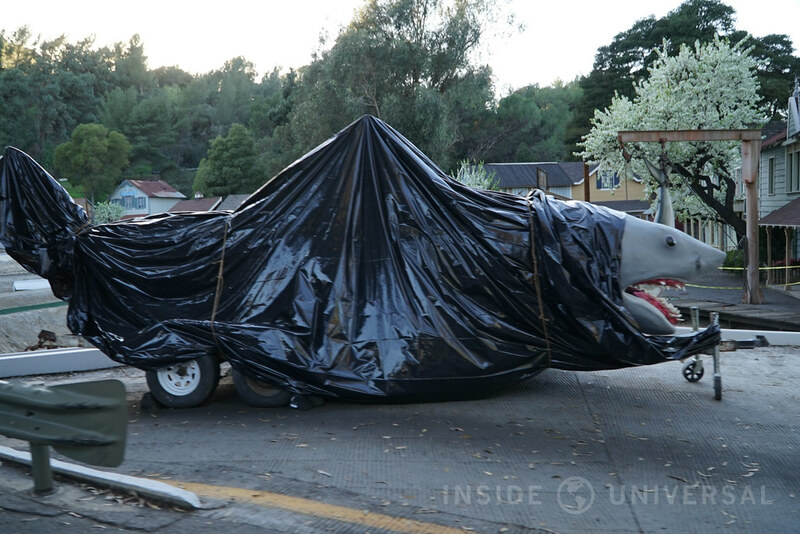 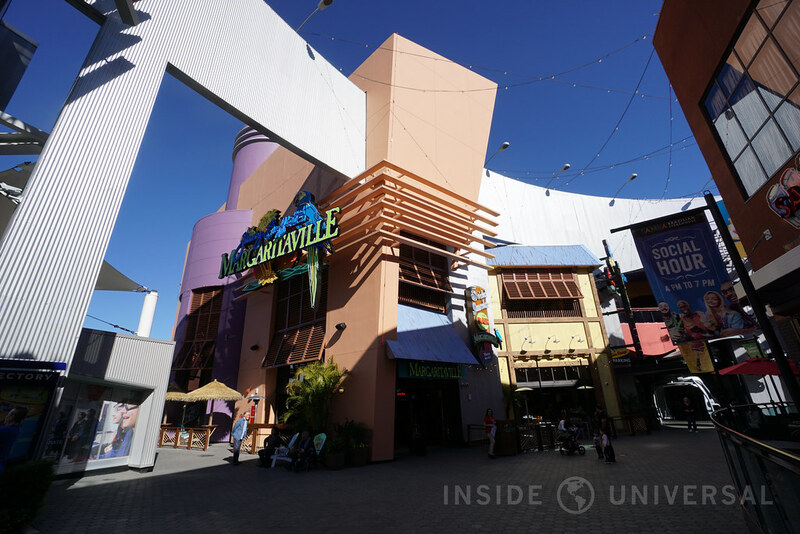 Stay tuned to Inside Universal for the latest developments on these stories and more originating from Universal Studios Hollywood. 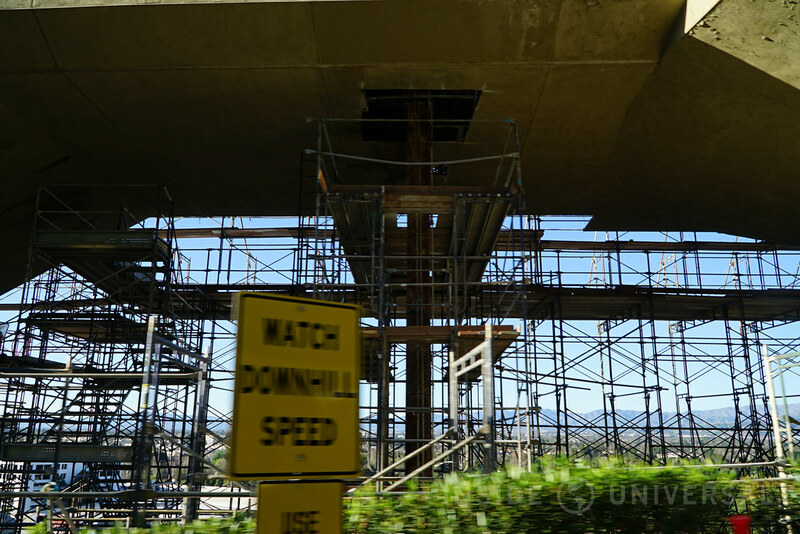 Be sure to also stay connected by following us on Twitter, Facebook and Instagram and be sure to join our forums over at USHForums.com.